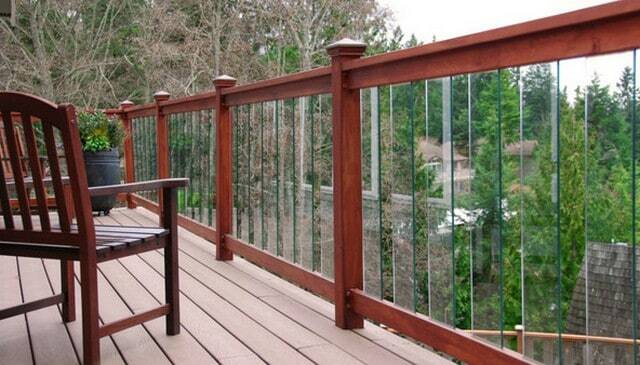 Choosing the best railing design for your deck can be tricky. 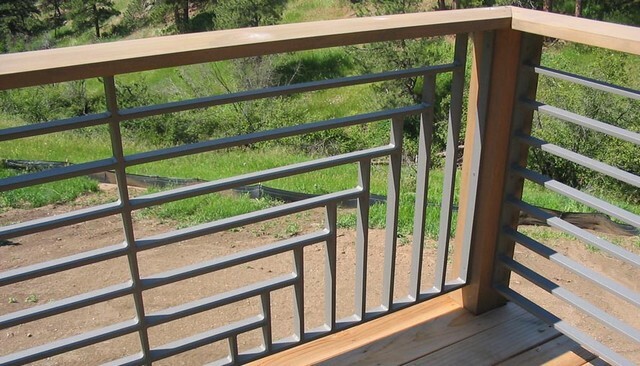 To help you decide, I assembled this list of more than two hundred different pictures of deck railing ideas and designs, organized by type for quick reference. The Guide is divided by material and style. Use the Table of Contents to jump to a specific category. 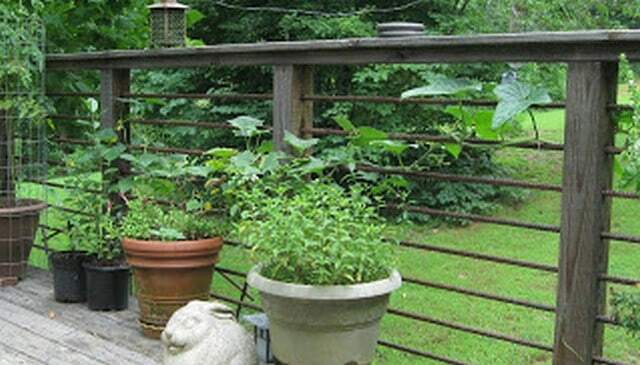 Let’s get started with my Favorite Railing Ideas! 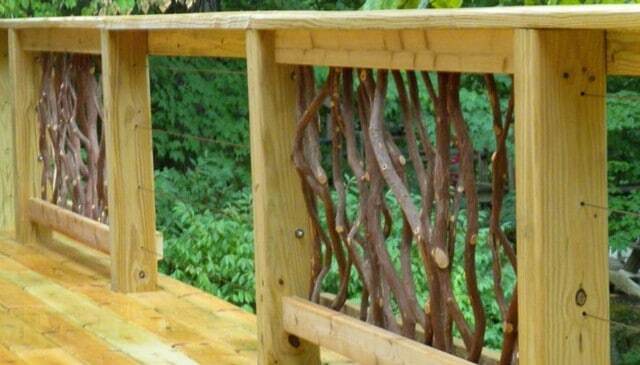 The best looking deck rail design is made by our master crafters with the branches of the mountain laurel tree. 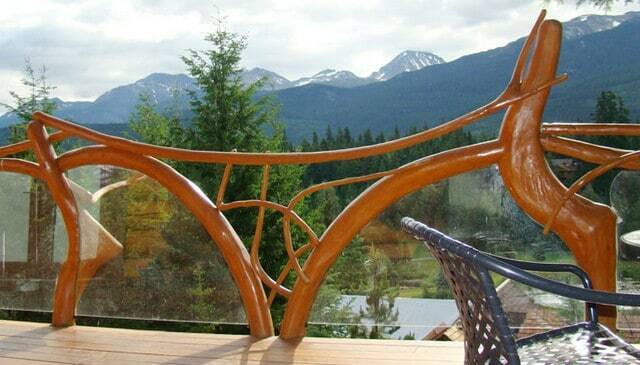 Mountain Laurel Handrails are works of art for beautiful decks. 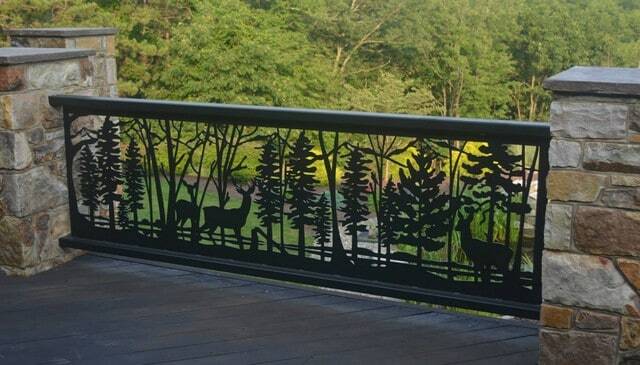 Another absolutely amazingly artistic addition to your home is NatureRails, creator of these one of a kind railing inserts. This cool deck idea can probably be cut into a panel in pretty much any shape you can come up with. 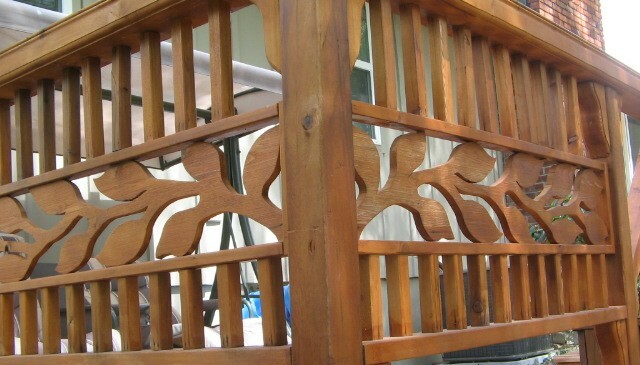 This deck railing incorporates multiple different styles and designs. 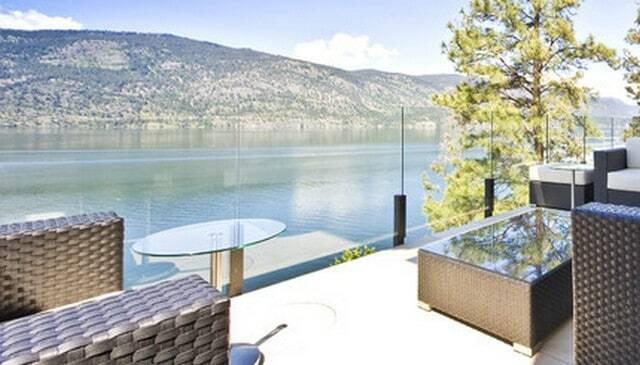 The wavy privacy screen dominates the view but there is also a 4×4 metal wire screen insert in a lumber framed opening. And the top piece is stained instead of painted like the rest. 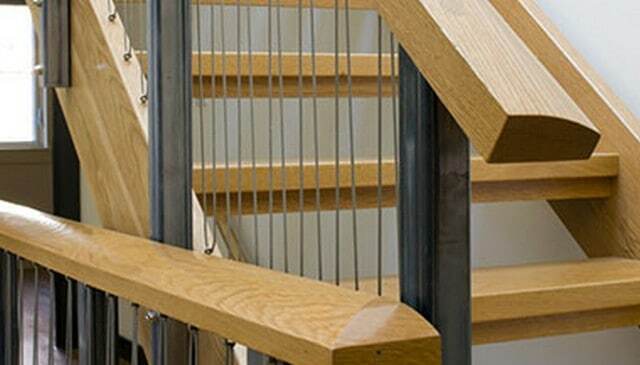 This awesome wood handrail design uses an incredible tongue-in-fork slip joint and uses a baluster of the railing as a peg or through tenon to hold the corner together. 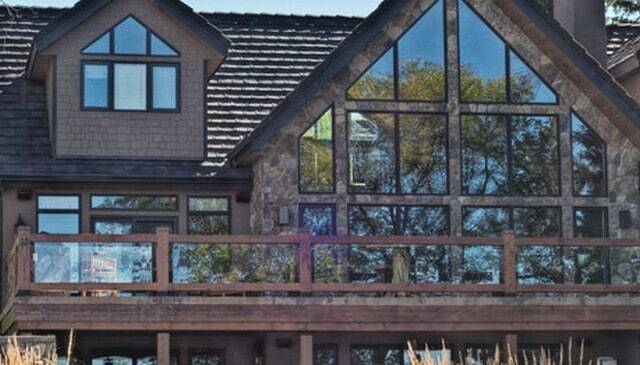 The house was built by a Minnesota couple and perfectly matches a timber frame. In this very unique work of craftsmanship, the artist bends and rolls metal pipes of various diameters into whimsical, organic shapes. Here, copper pipes swirl round a radiating sun, or sunflower reflected on a drop of water. 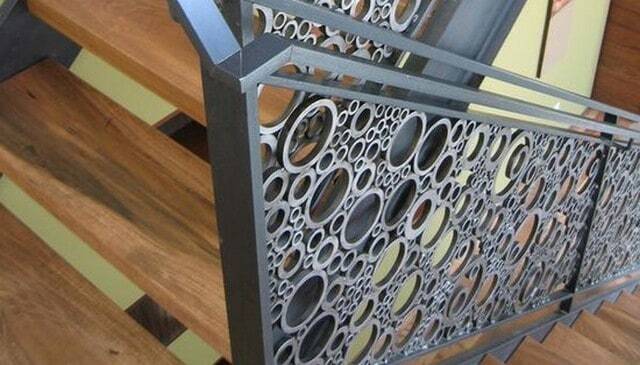 Abstract shapes let your imagination play about this great railing. 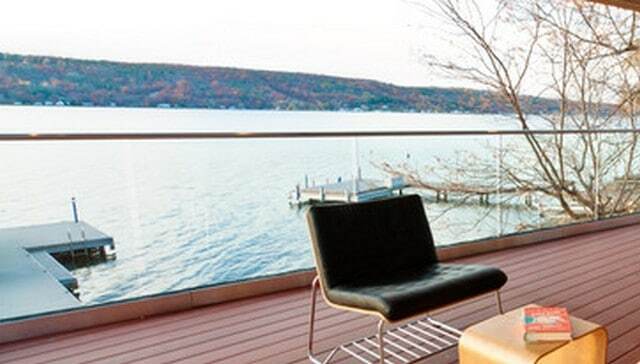 Keuka Studios Tokyo Style cable railing exemplifies the best features of wire deck railing and this picture really shows how they let the background and the view shine through. 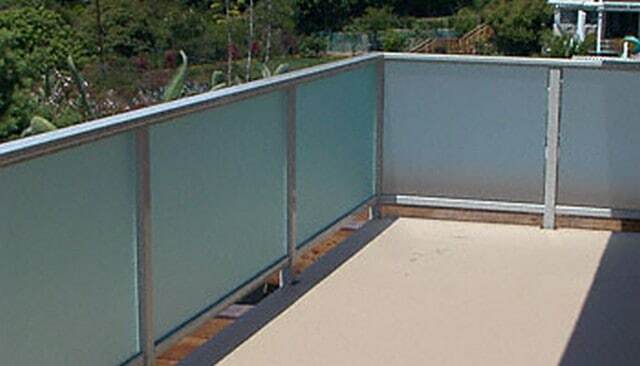 This frameless glass railing absolutely defines the best features of using glass as a material. The serene beauty of this mountain lake shines through and nothing gets in the way of the amazing scenery! Break out of the mold and think outside the box with… boxes. 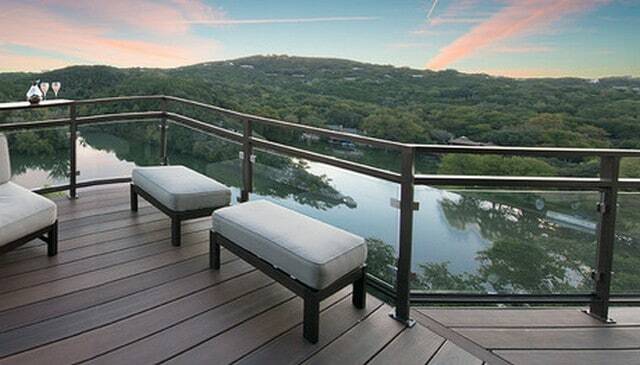 This balustrade uses a series of rectangular metal boxes to create a modern deck railing. It’s certainly far from the first thing you’d think of! 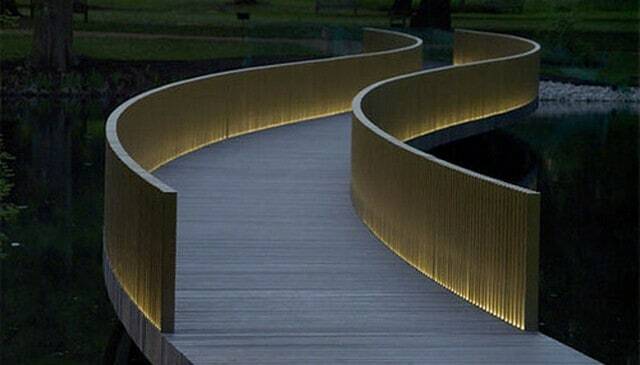 This incredible modern handrail uses a bridge as a palette for line and light. 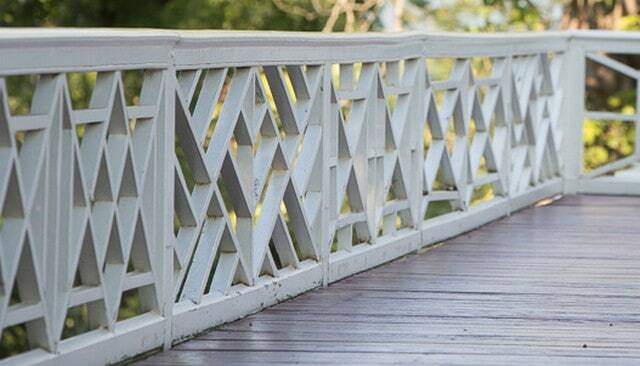 The simple curve of the bridge is highlighted on either side with single metal balusters with lighting between them. Sometimes the simplest in variations can create an entirely new and interesting pattern. 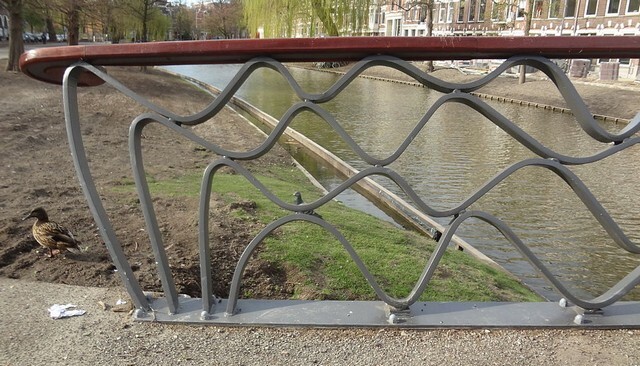 Here, the vertical balusters are given a little wiggle with a sine wave down the length. 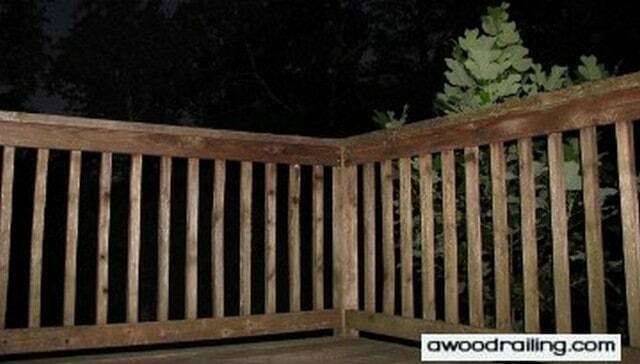 This gives some visual excitement to this out side deck. 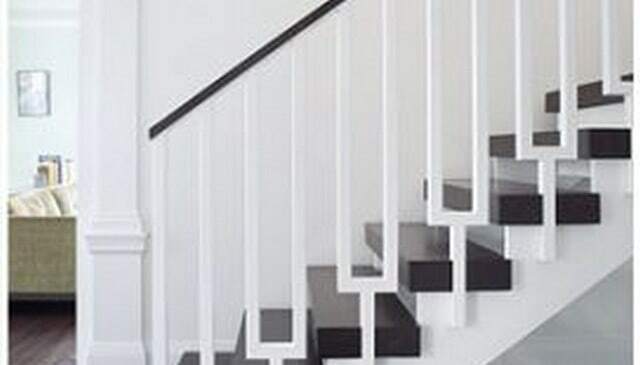 This balustrade uses evenly spaced vertical 2x4s with a horizontal 2×4 below center which connects to the bottom with diagonal blocking. 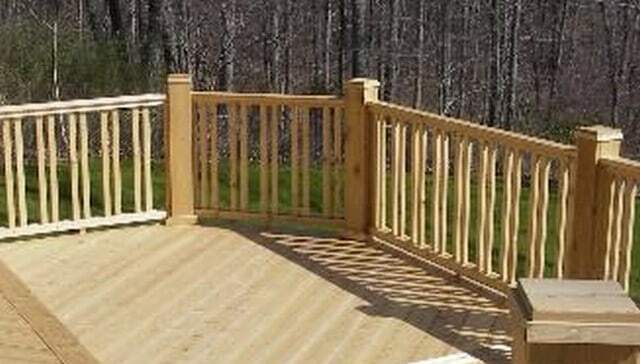 This cheap deck idea gives the look of a row of arrows pointing to the sky. 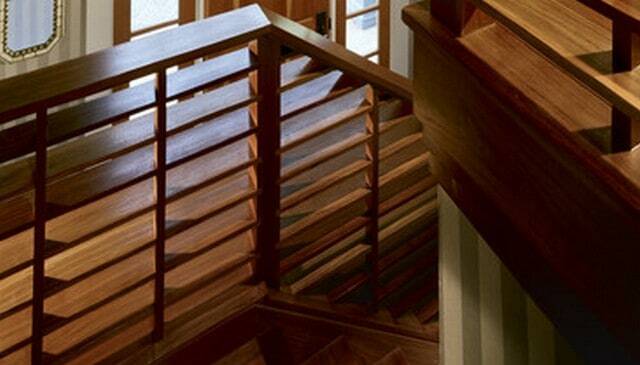 Diagonal 1x4s run from corner to corner of this wooden railing and the direction alternates from one to the next. 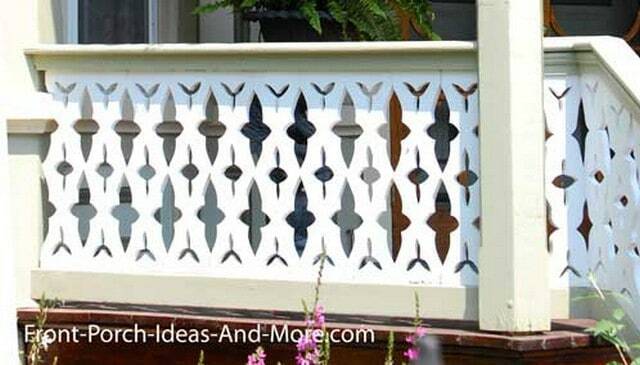 This is a good way to create some movement in your patio railing design. 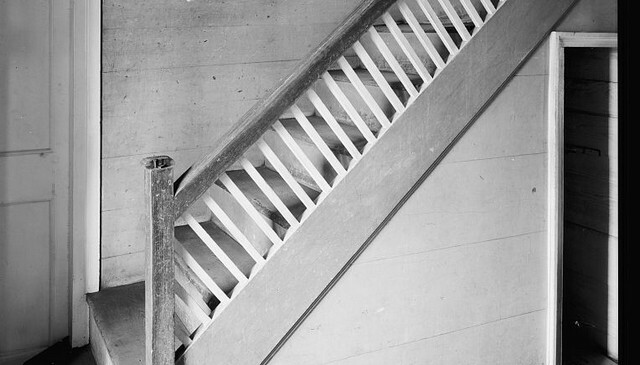 On this historic banister and railing, the balusters are placed at a right angle to the stairs. 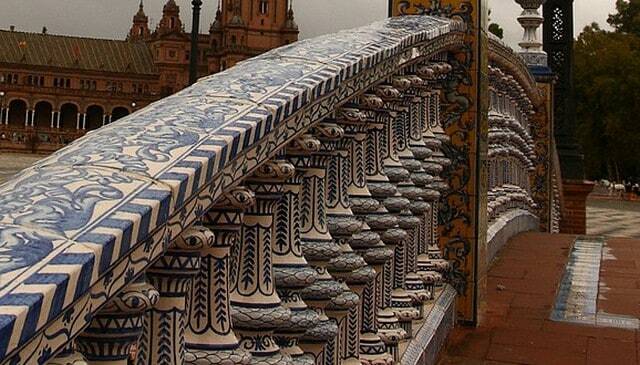 This is a welcome relief from so many of the vertical patterns that are prevalent. 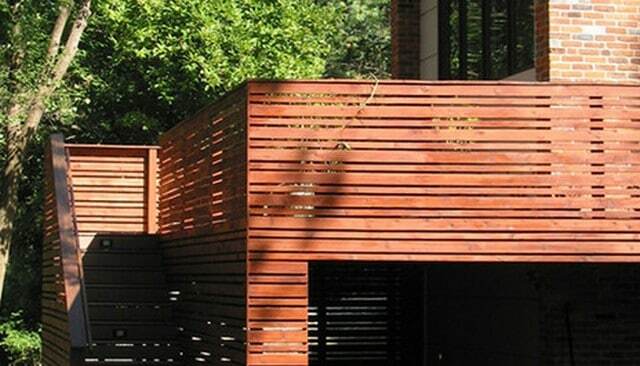 Instead of a railing that has spaces, eliminate deck spindles and continue with a solid knee wall in the same pattern as the siding, which in this deck design picture is nicely weathered cedar shingles. 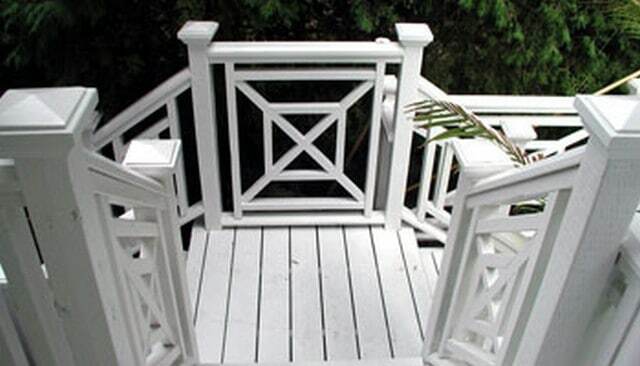 Instead of all the same size, this deck baluster idea uses alternating width boards, which appear to be 1x2s and 1x6s with about 3 inches of space between. 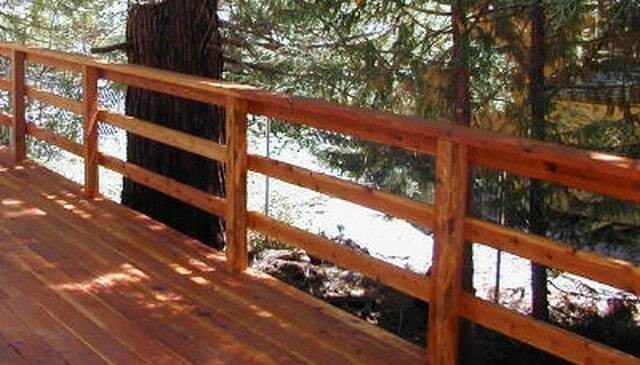 Wood railing designs for decks can use a continuous 2×6 to cap the posts. 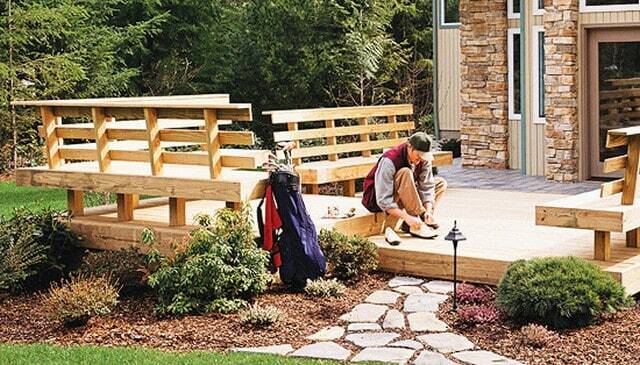 This simple DIY deck idea is 3.5″ below this and consists of vertical 2x4s between 2×4 top and bottom plates. Fine craftsmanship is exemplified in warm, natural wood tones and the interplay of light and shadow in this bannister and rail. The eight tiers of horizontal lines continue strong themes established by the ceiling and windows. 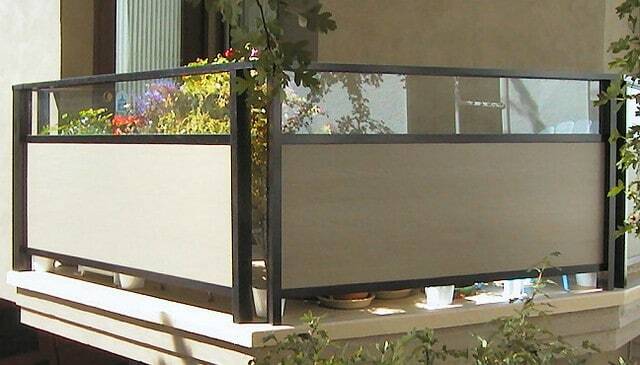 A privacy screen lets light and the view in but keeps unwanted eyes from peering too closely by utilizing alternating 1x4s and 1x2s with 1.5″ spacing in between. 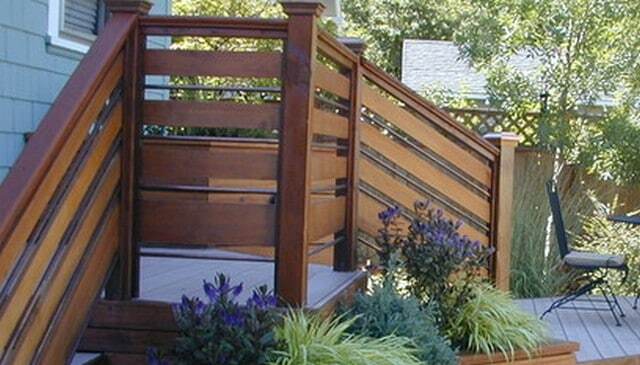 Horizontal 2x2s replace the typical wood deck spindles in this simple DIY handrail. 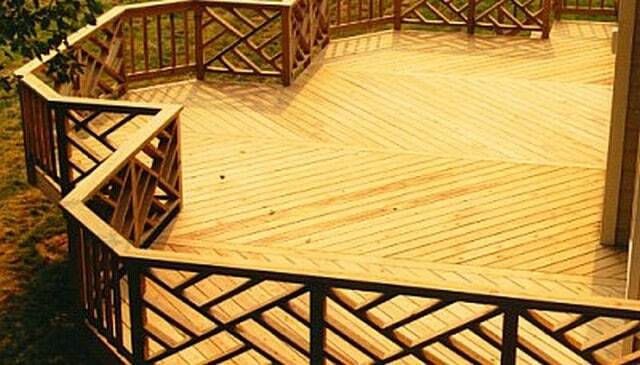 This would be an easy way to change the look of your deck. 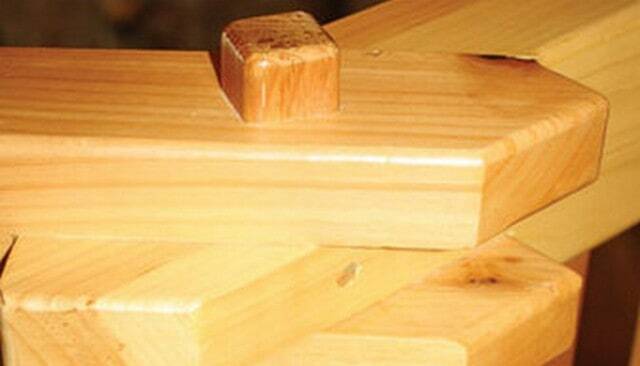 Here, vertical 2x2s are placed tightly in groups of 3 with 3.5″ of spacing between each one. 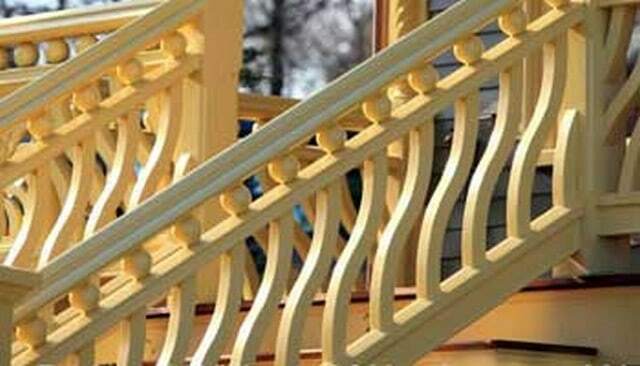 The bottom rail is placed on one side on the face of the balusters. 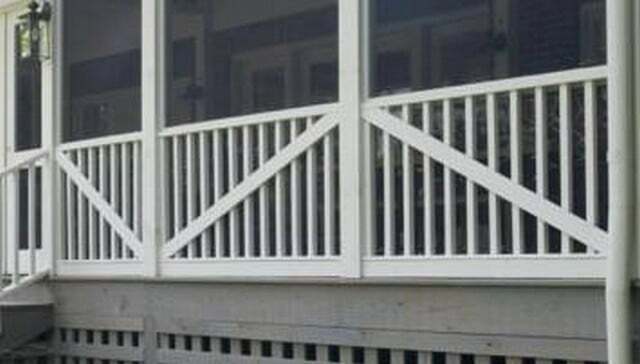 Another easy way to change the look of an existing front porch deck is to rearrange the spacing of the railing spindles with pressure treated 2x2s spaced alternately 1.5″ and 3″. 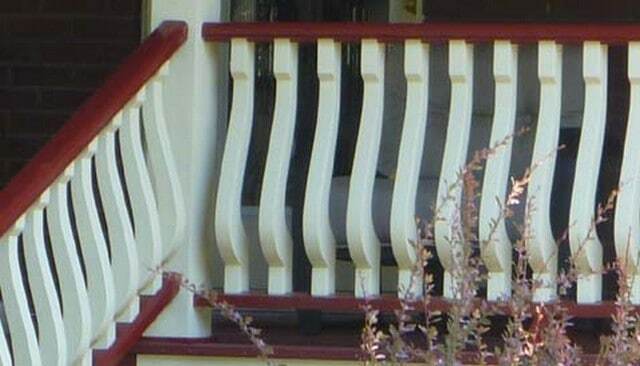 Both the bottom rail and the balusters in this white deck railing were milled to drain water and individually painted before assembly. 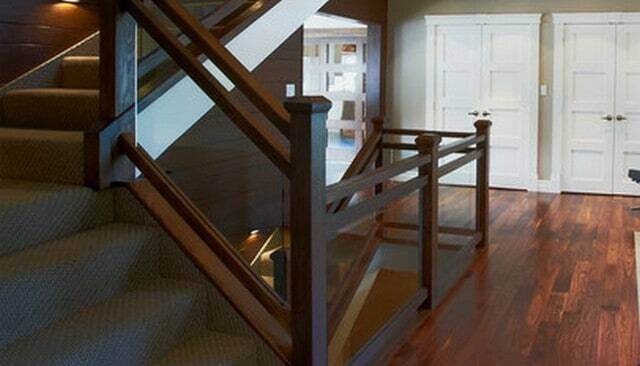 This deck stair railing is a large format style of the parquet flooring look replicated on a stair handrail with 1×4 lumber placed horizontally. 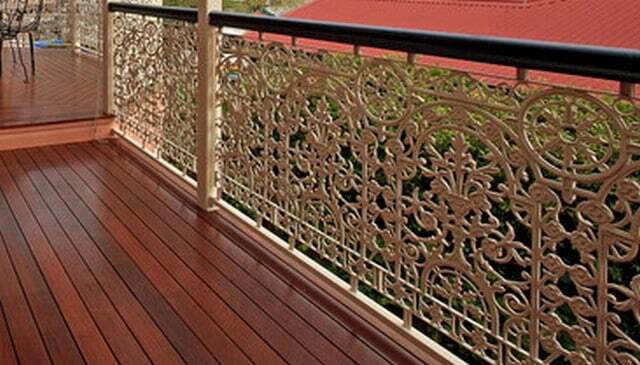 Alternate the view with a parquet floor pattern used on a veranda fence. In this picture, the pieces appear to be spaced on a 16″ grid. 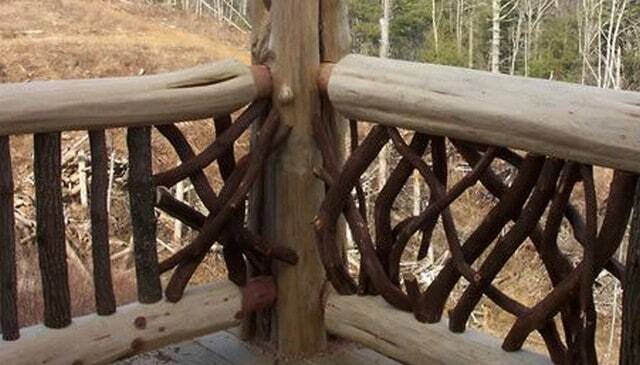 Arrows move the eye around the view in this wood railing design. 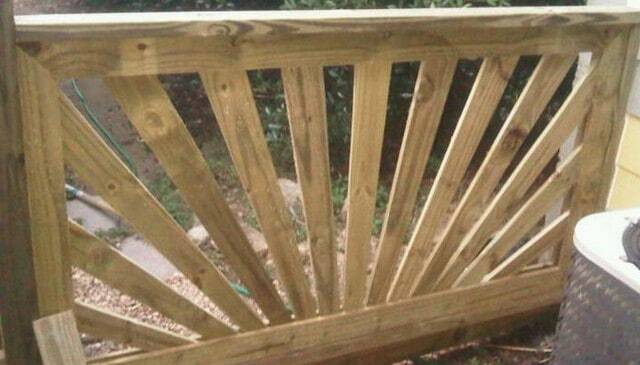 Sideways pointed arrows start at a central deck railing post and radiate outwards. 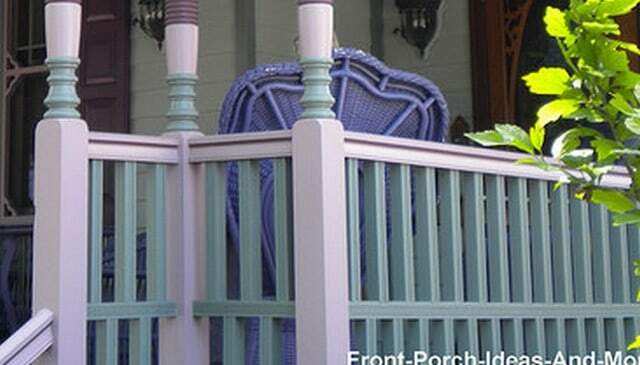 Spice it up with two board widths and two colors on your railing. 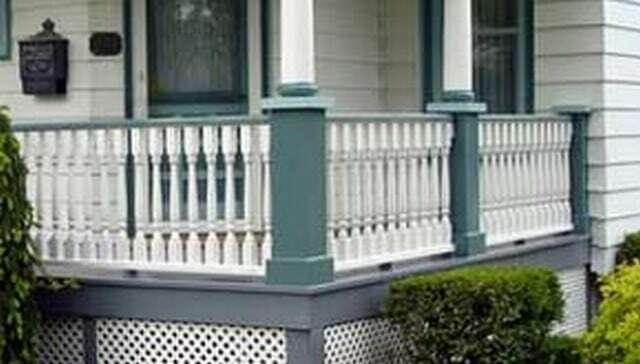 Here, 1×6 alternates with double 2×2 balusters with the posts painted a different color. 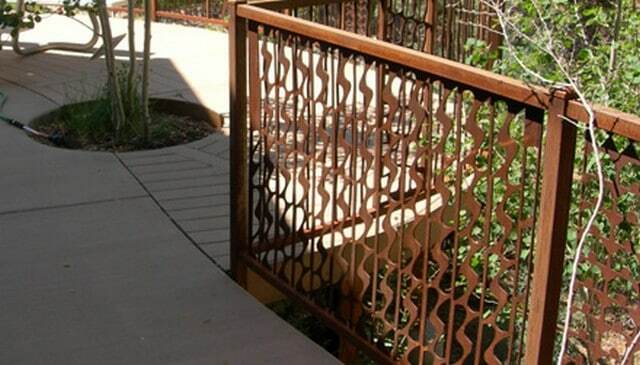 Diamond shaped portholes peer through a custom wood lattice in this intriguing deck rails idea. The diamond shapes nicely contrast the smaller squares. 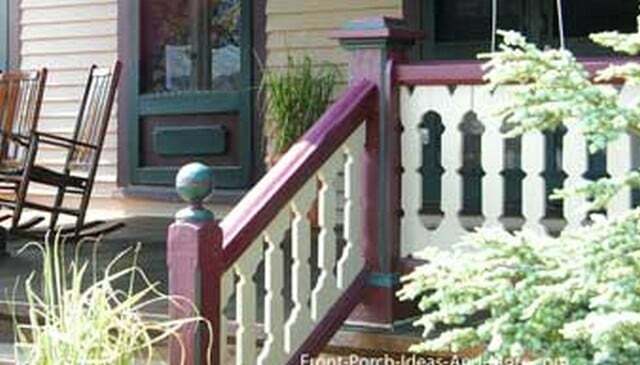 This porch railings design is another easy DIY way to change your handrail. 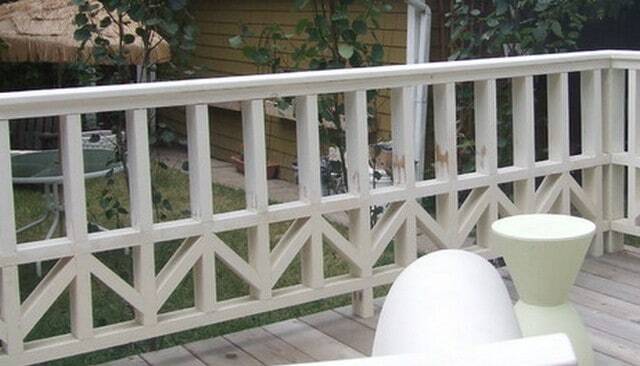 It uses painted lattice framed below a continuous 2×4 top going between the posts. Curves in the pattern break up the monotony of straight lines seen in most images of decks. 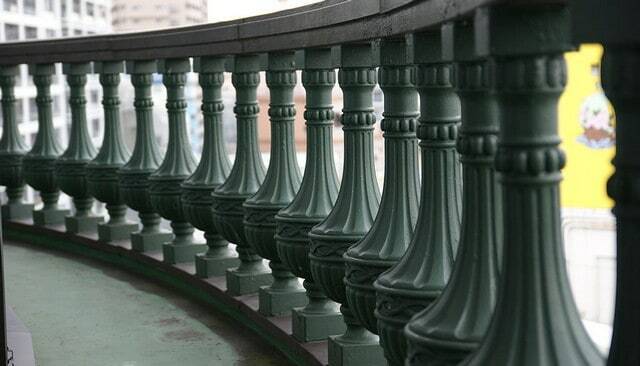 Here, tightly spaced ovals create many interesting shapes in the balustrade. 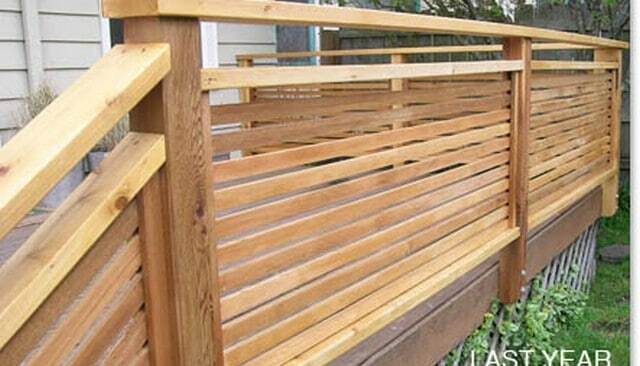 This wood privacy handrail uses 1×2 slats running horizontally between top and bottom 2×4 rails with a continuous 2×6 top plate capping the posts. 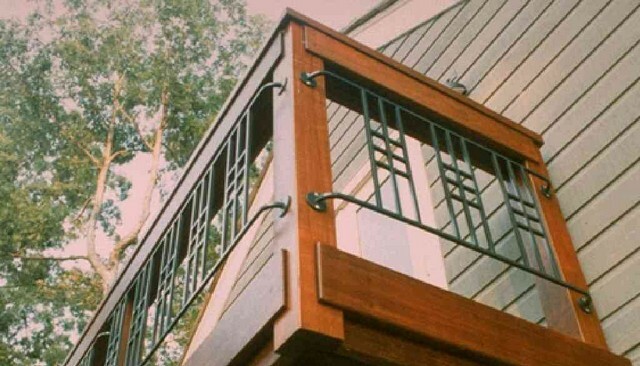 This cheap deck railing idea is standard pressure treated wood railing made with 2×4 top and bottom rails with 2×2 pickets nailed vertically all capped with a 2×6 top plate. Tuning forks like used to tune musical instruments grow from the side of this stair railing. 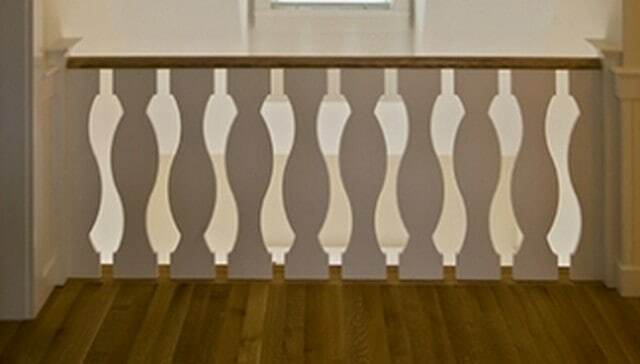 The carpentry on this banister idea is particularly nice. 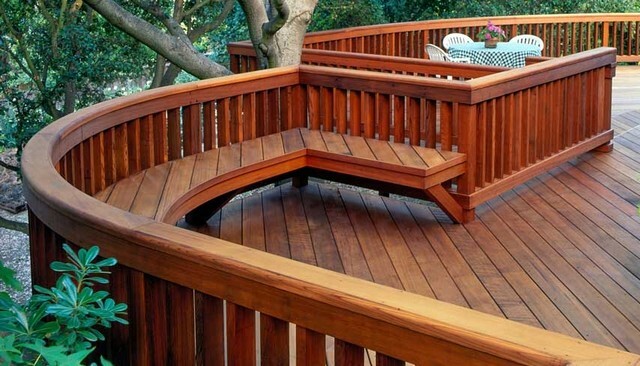 Some decks have curved framing to break away from the standard straight lines. 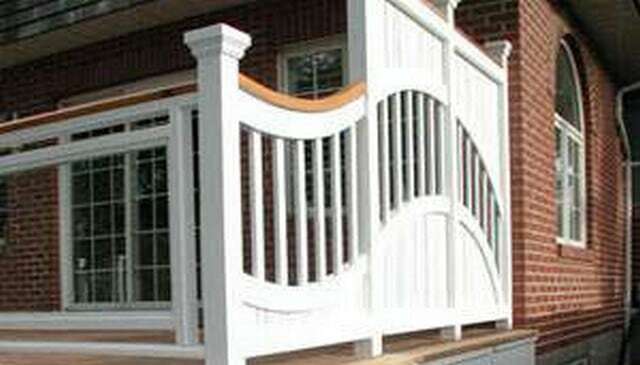 Here are more pictures of curved railing will make your deck that much better. 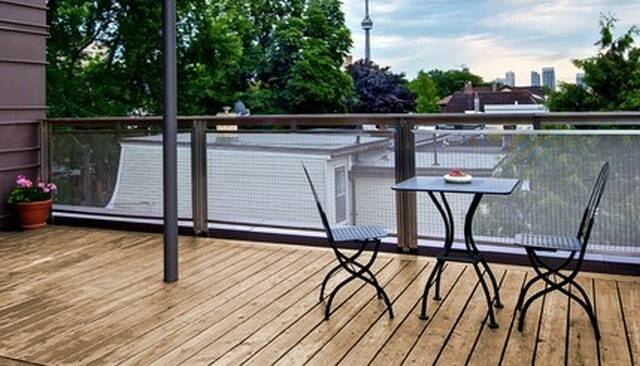 This deck without railing is a great low deck idea with plenty of room to sit. 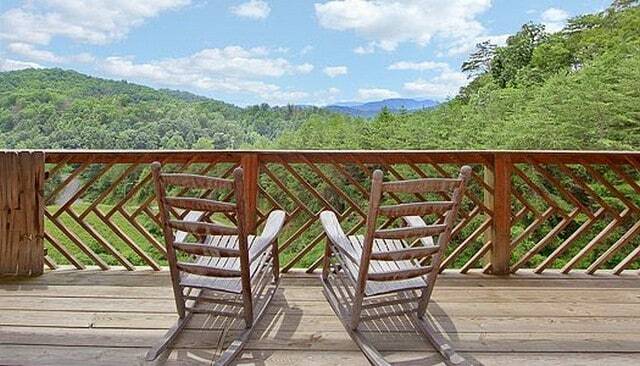 This looks like the perfect place to fire up the grill and have a drink. 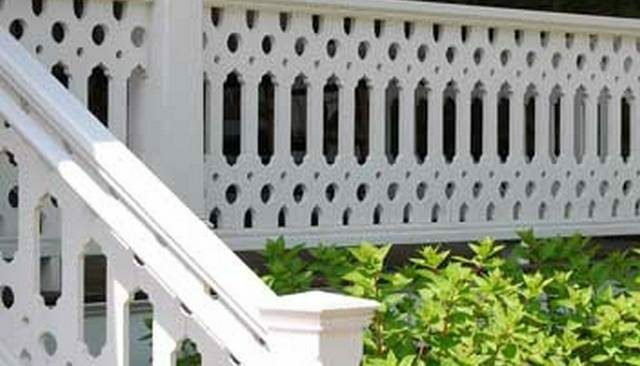 This historic porch fence is quite unique and seems to be a riff on the Chippendale and Art Deco styles. An “X” spans from post to post with a small central box capped with a triangle. 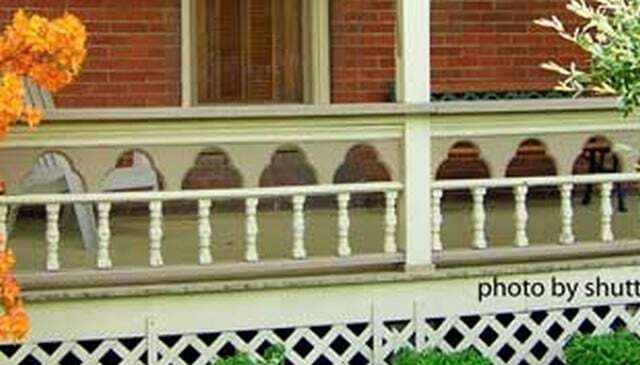 Alternately spaced porch spindles are broken by a horizontal 2×4 for some additional architectural pizazz on these Victorian style home railing designs. 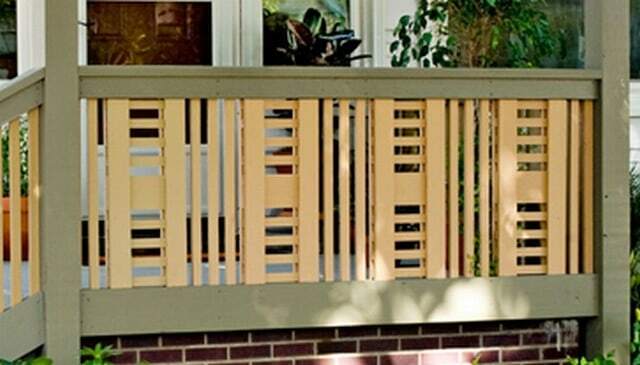 The typical vertical picket style is broken up here by a ‘strikethrough’ of a single diagonal board running up and down from post to post on this inexpensive deck railing. 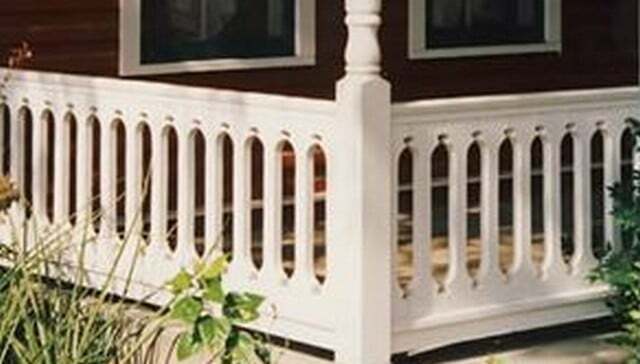 These porch rails use a scroll saw cut triple-circle arch pattern over a lower level of smaller balusters. Additionally, the two elements are painted different colors. 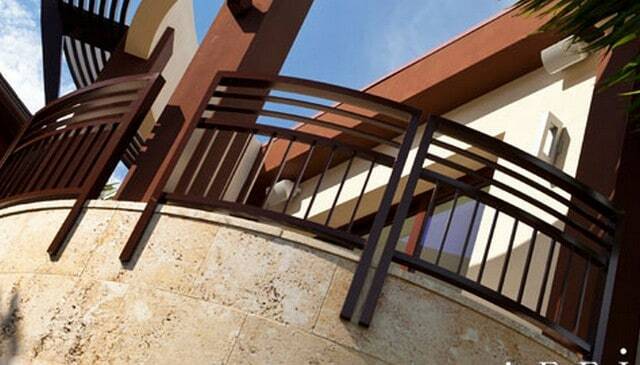 This outdoor railings for steps uses wavy balustersbelow a row of alternately placed spheres. 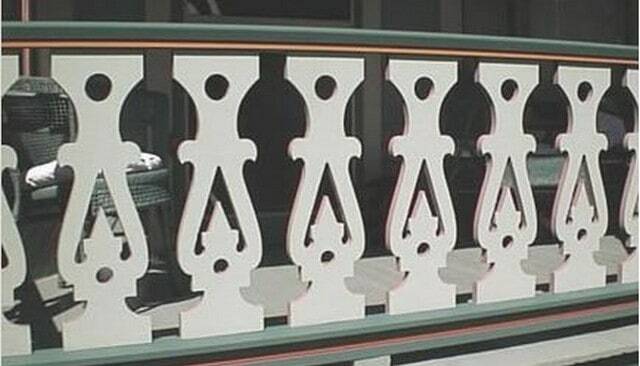 The effect is almost like a person in the railing. 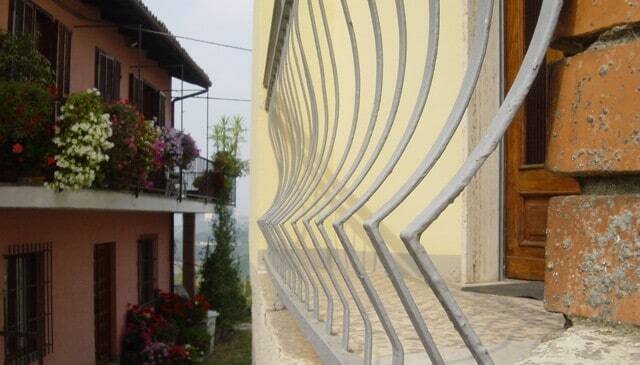 Here’s a simple diagonal “X” railing that is very well executed. The carpenters on this project certainly had their geometry cut out for them as you can see by looking at the panels on either side of the stairs. 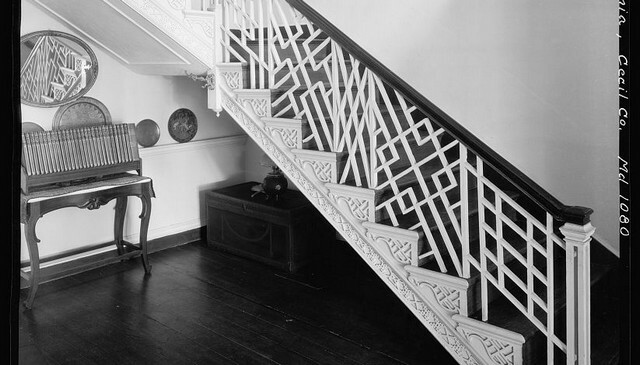 This photo shows a chippendale railing which uses diagonal patterns to create flow across the handrail. This basic style uses an “x” from post to post with arms growing off of it. 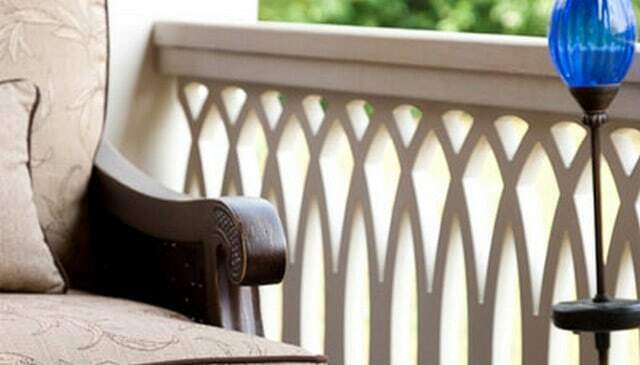 The deck fence from Thomas Jefferson’s neo-classical home Monticello, complements the discipline of the classical setting and stately architecture with balanced angles and division of space. 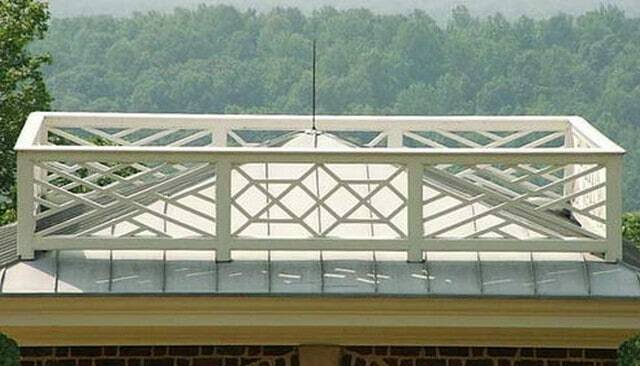 This picture is from Thomas Jefferson’s home, Monticello, and shows the cupola with two styles of Chippendale railing capping the roof. 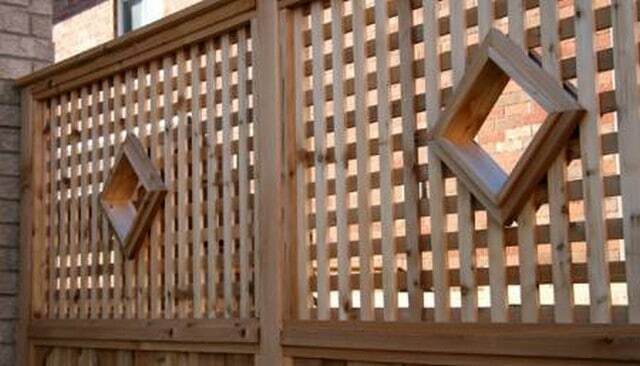 This multiple X pattern divides deck railing posts spans into smaller sections which then have an X surrounded by a box and modified oval. 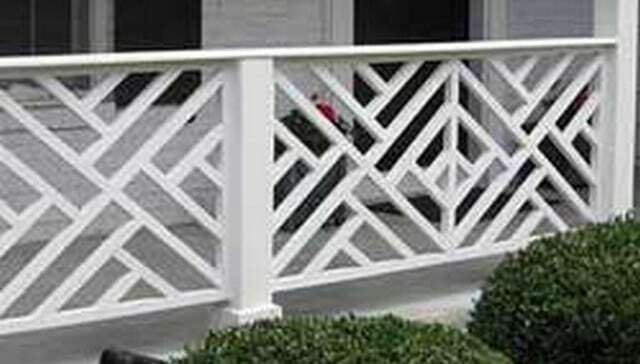 Next of the wood porch railing designs uses multiple “x”s arranged in a 2×3 grid. 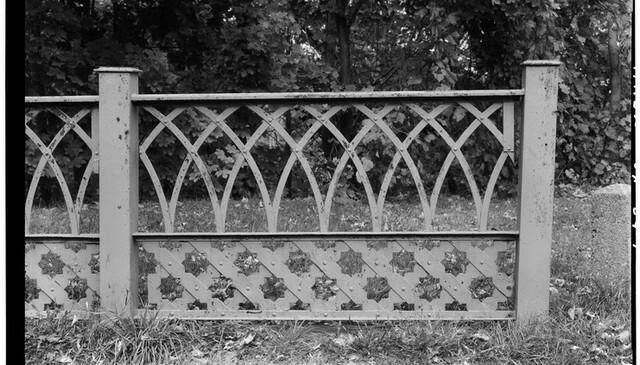 Each span has the central chippendale element flanked by lattice to finish it out. 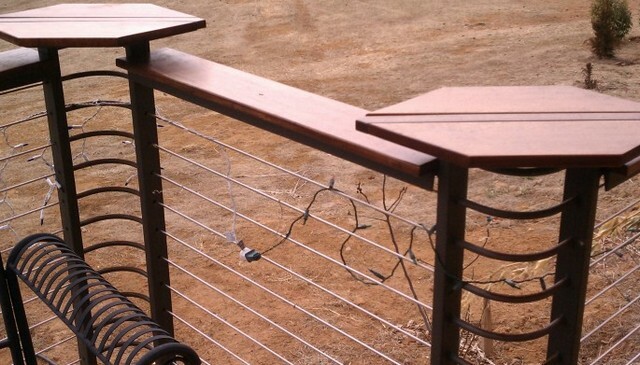 This outdoor hand railing adds multiple horizontal and vertical elements to the central X so it seems as if there are many squares around the X. In this deck on front of house, each post to post span has three, double-squared X shapes but this time the X’s don’t form a central cross but instead terminate into a small box. 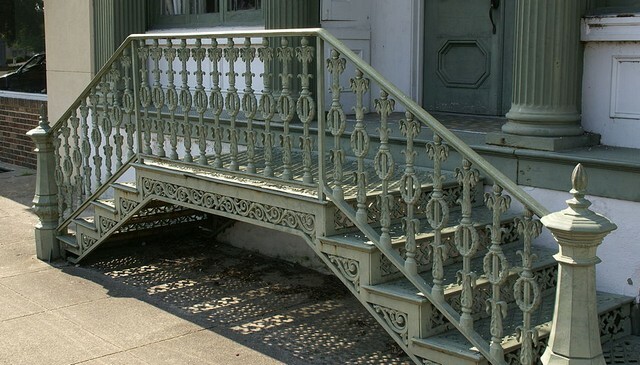 This historic stair railing shows multiple patterns in the chippendale style. 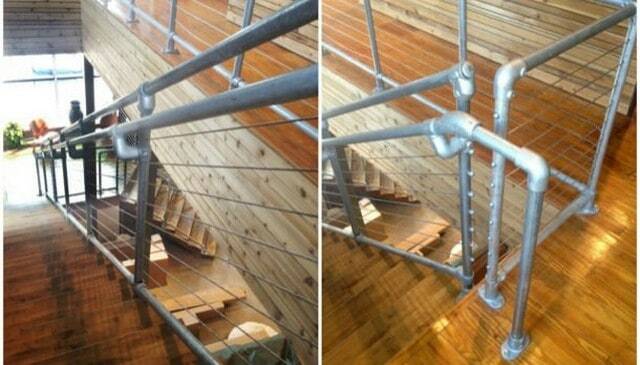 The carpentry indoor railing idea demonstrates the crafter’s incredible knowledge of geometry. 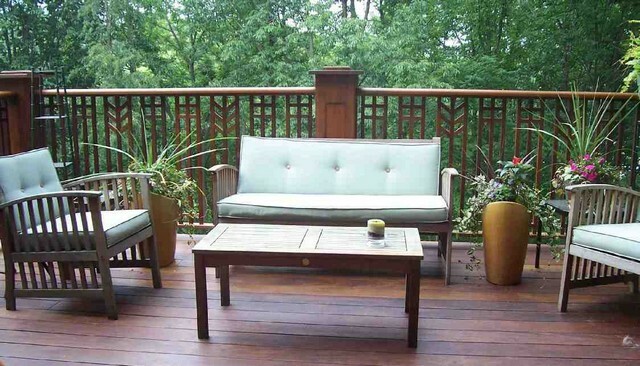 Combine typical vertical picket style and diagonal based chippendale elements for this simple deck idea on an expansive exterior uncovered deck. This wooden porch rail reminds me of the Eye of Sauron watching. The pattern has an X with the center enclosed by a modified oval which is the “eye” shape. Blending American Craftsman with Art Deco, the dark tones and stone foundation of this home are balanced, lifted by the light, thin, vertical lines of railing, punctuated by obelisk style posts. 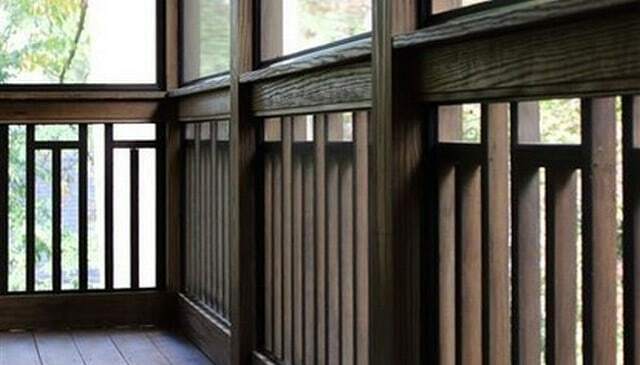 By bunching up certain elements and spreading out others, this balcony railing demonstrates one of the main principles of the craftsman style: that the spaces are as important as the pieces. 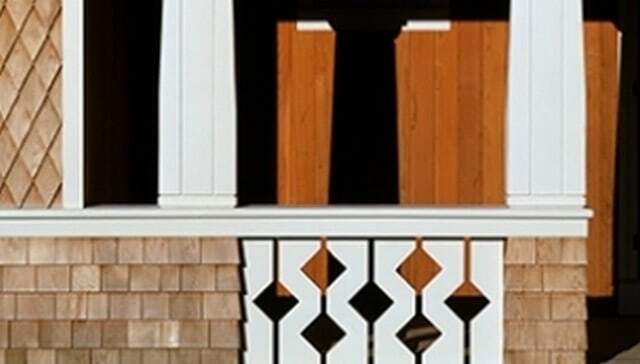 This wooden decks design idea shows typical deck baluster spacing with the triple horizontal pieces at the top of the railing, making a partial lattice effect. 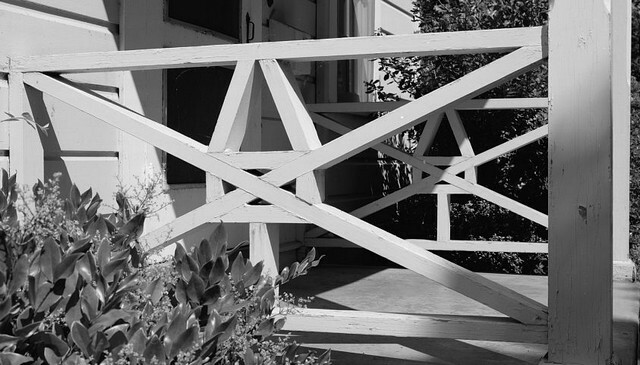 This picture comes from the Library of Congresshistorical survey and is a detail of a cheap porch railing idea in Lahaina, Maui County, Hawaii and was taken around 1933. 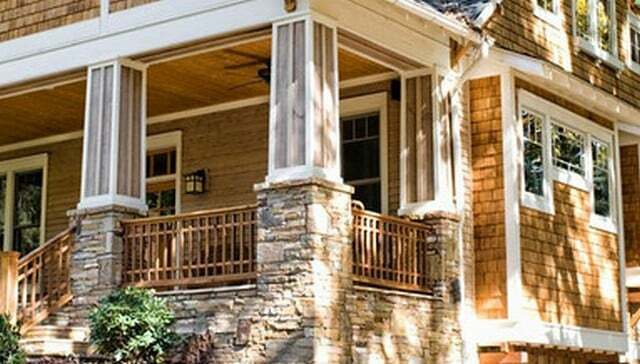 The porch step railing on this home uses stone post bases for mass while the handrail has double horizontal elements on the top and bottom to match the exterior woodwork. 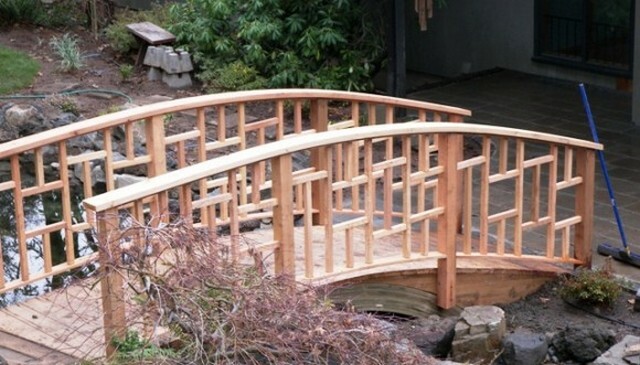 The Craftsman style meets East Asia in this Zen inspired bridge railing. The broom leaning up against it sends a signal that the carpenters are done! 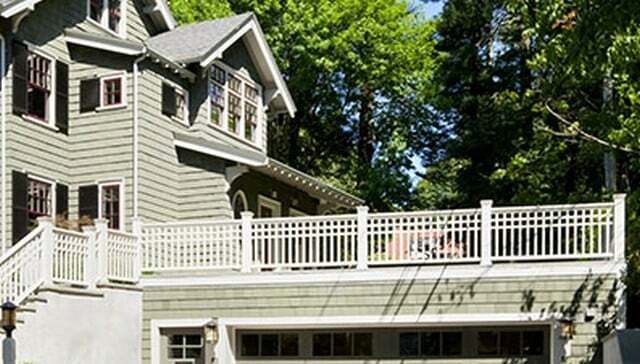 This craftsman handrail uses alternately spaced, doubled porch spindles with two central horizontal elements from post to post capped by a 2×6 on edge for the top rail. 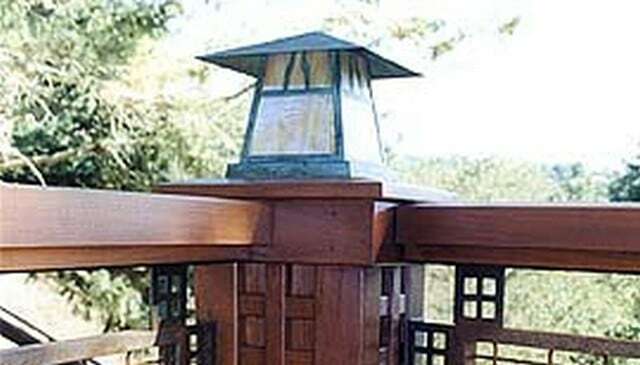 An interesting technique of the craftsman style was including small details as demonstrated here with the small grid motif repeated and the porch post idea of using a lantern as a cap. 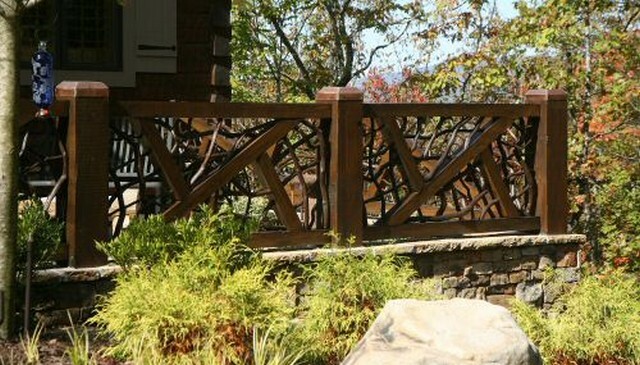 This unique deck railing idea pushes the craftsman style to the limit and loses sight of the element of spacing with the busy pattern on this outside deck. 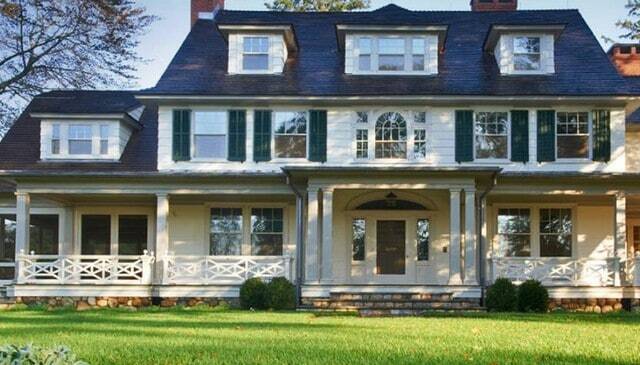 Prairie style was a riff on the craftsman emphasis on intricate, yet simple woodwork. 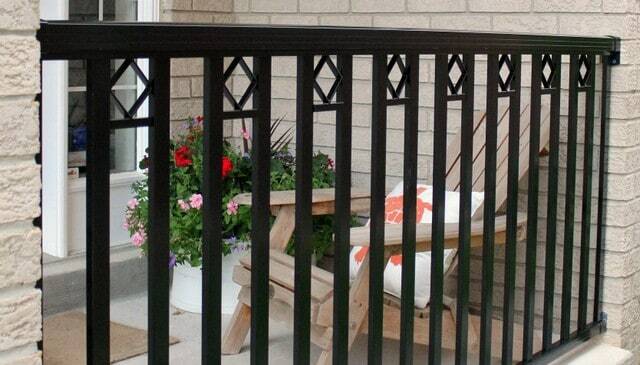 This prairie style ipe deck railing is a good example of this spin on deck fencing. 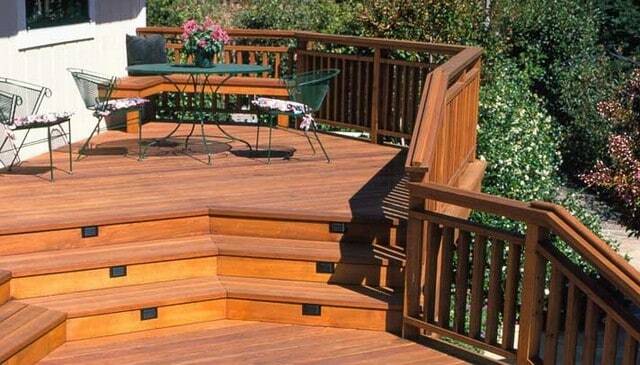 This wood deck design shows the craftsman tendency to introduce space as an element of style. Here, the vertical 2x2s are broken up by a horizontal space below the top rail. Another historic deck design idea photo showing an interesting variation with vertical 2x2s broken up top and bottom with wide expanses of space. 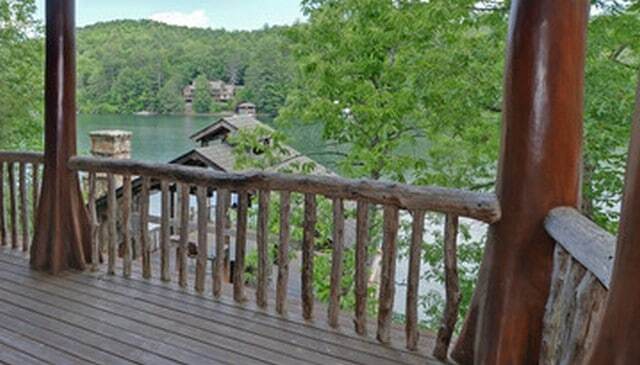 Overlooking Lake Rabun, Georgia, this log handrail features a single top approximate 4″ diameter log rail connecting log posts with 2″-3″ log balusters attached to the decking. 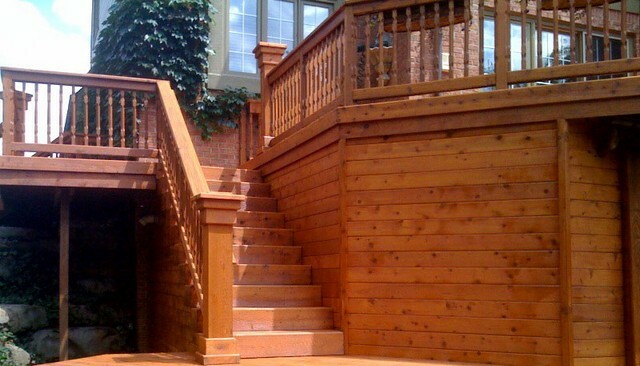 A grand example of a typical log rustic stairs railing, the 6″ posts are connected by similar diameter top and bottom rails with balusters attached with mortise and tenon joint. Next in the collection of home deck ideas uses horizontal 6×6 lumber with blocks for spacing to create an interesting big timber rustic railing, a perfect back porch idea on a budget. 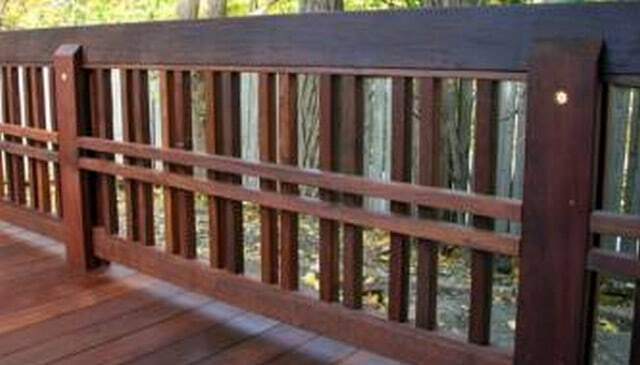 Top, bottom and central stained cedar boards are connected to log posts in this sparse and open horizontal deck railing idea. 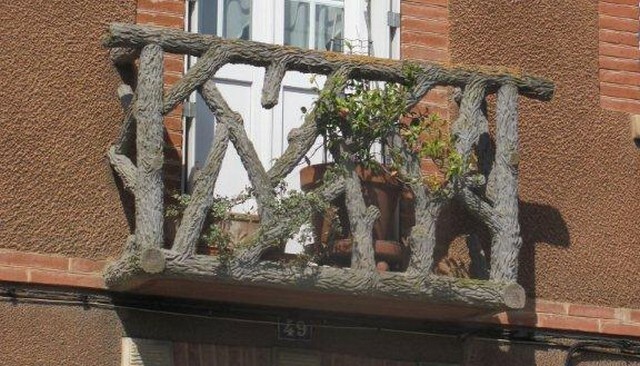 From my mom’s hiking adventure on the French Way of the Camino de Santiago comes this picture of a balcony with a open log railing. 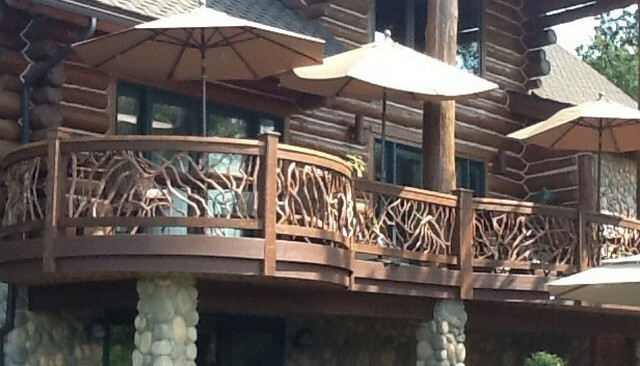 Vertical logs about 2″ to 3″ diameter with the bark on are the central part of the railing with woven branches on either end between log rails with log posts on this outdoor handrail. 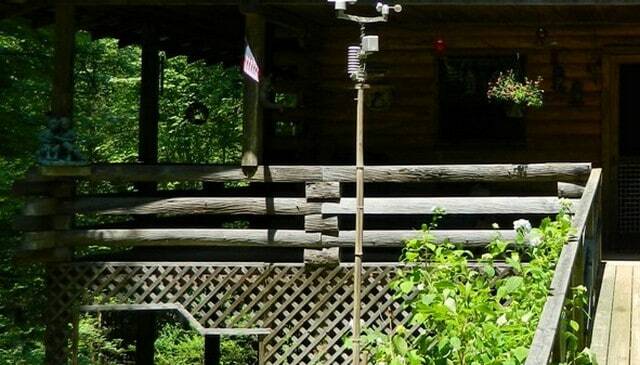 Relax in this rustic log framed porch and enjoy the view through the branch railings for decks, made here with 6″ locust top and bottom logs connected with mountain laurel branches. For the modern rustic home, this outdoor deck design idea incorporates interesting triangle geometry made with 1×4 lumber sandwiched over a branch guard rail. 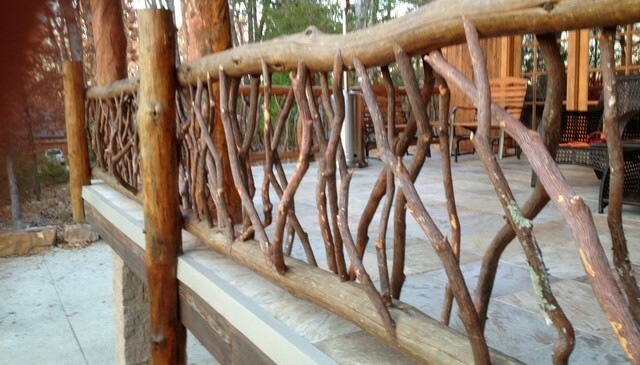 An original concept by the architects of the Lissara Lodge, this deck rail frames the branches with different sizes of lumber and openings to make the branchwork the centerpiece of each section. 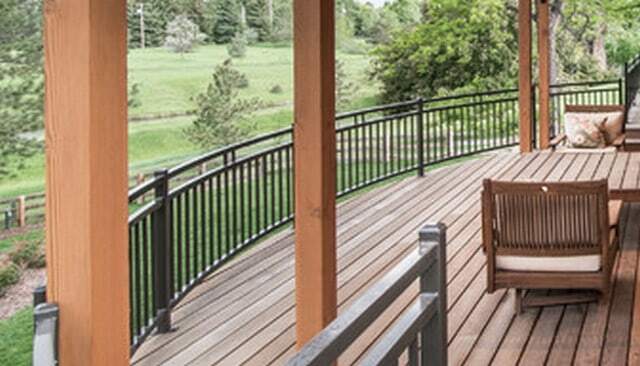 The various widths, textures and types of wood used for this wooden porch railing highlight the playful nature of the raised deck, built around a tree. The inverted delta shapes draw your attention upwards through the canopy. 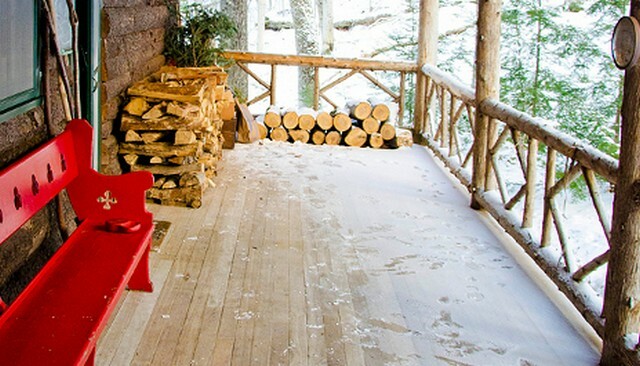 The simple elegance and bold nature of this inexpensive deck idea reflect the strength and confidence of the American pioneer spirit, quietly stated in open diamond shaped railing and strong posts that invite the forest to this secluded log cabin. 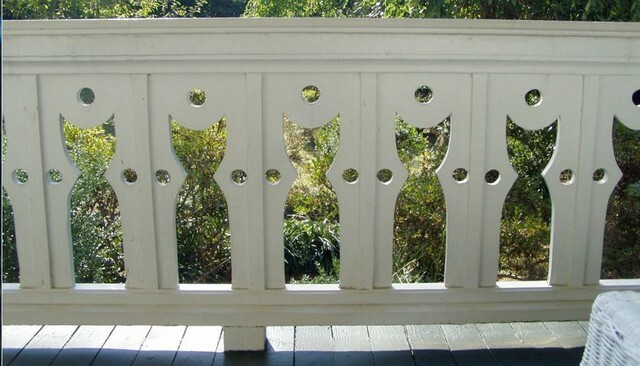 For all the cat lovers on the internet, check out these sawn balusters that look like cats. Each cat is cutout and is surrounded by three small circles. 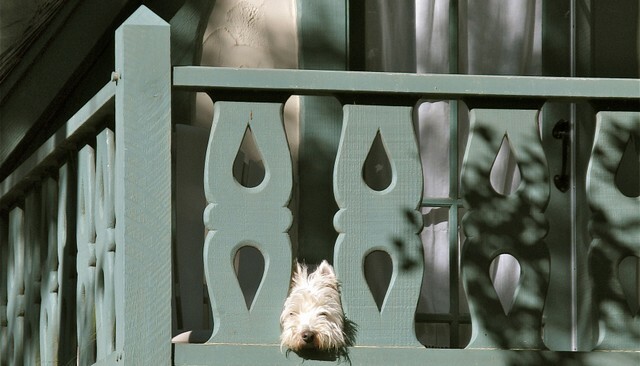 This balcony handrail uses jigsaw cut balusters with a double teardrop, one pointing up and the other pointing down, with a cute little dog poking her head through. 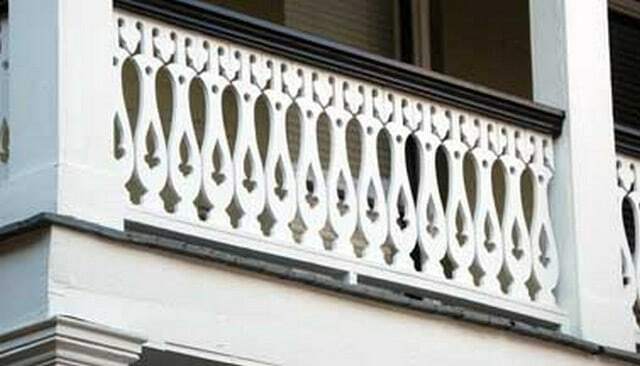 Sign your love letters with a heart exclamation point as shown in this picture of a balcony handrail. 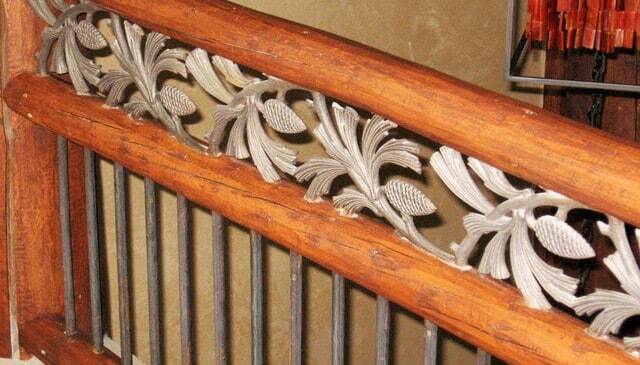 Sawn balusters can be cut into many different patterns. It kind of looks like this pattern may be like an airplane propeller placed every other sawn baluster but it’s hard to tell. 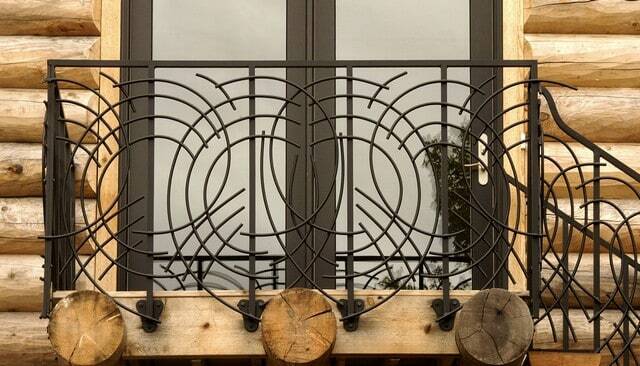 The alternate baluster has three circles. 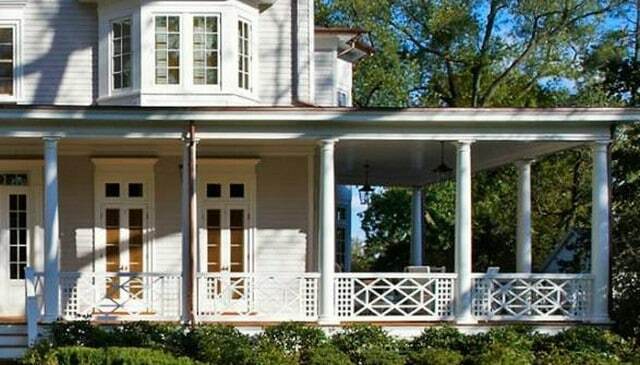 This front porch uses a solid wall railing with columns above. 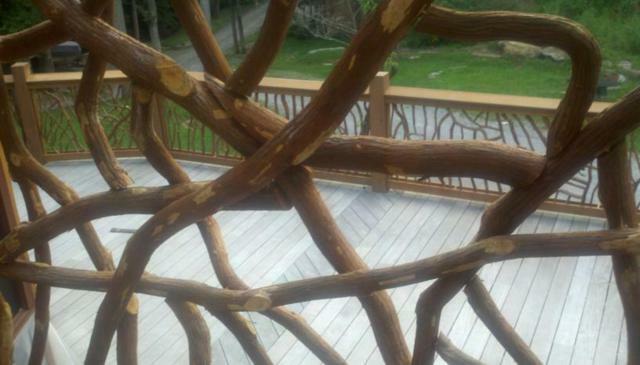 The center point is the big diamonds in the jigsaw cut porch railing. 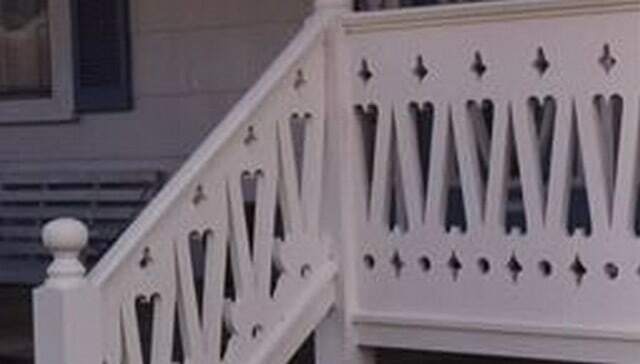 This stair handrail uses sawn balusters with smaller diamonds set at alternating heights near the top of the panel which is attached to the outside of the stair stringer. 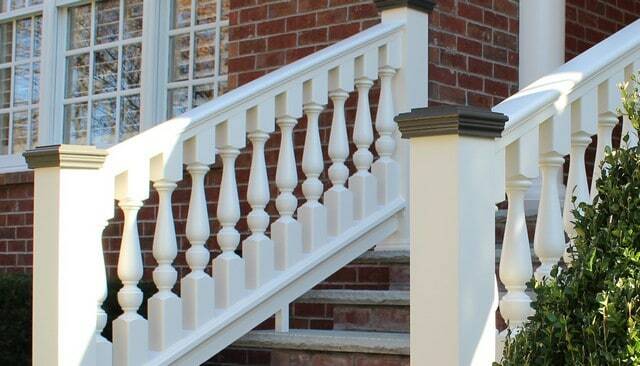 These sawn balusters make a graceful arc that alternates directions. The form of the opening is almost like a stylized goose or a swan. 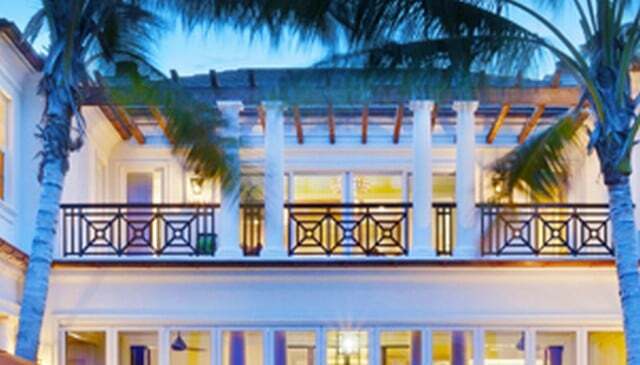 This beach house deck railing employs a graceful arc, this time going from bottom to top, left to right, drawing the eye around the home. 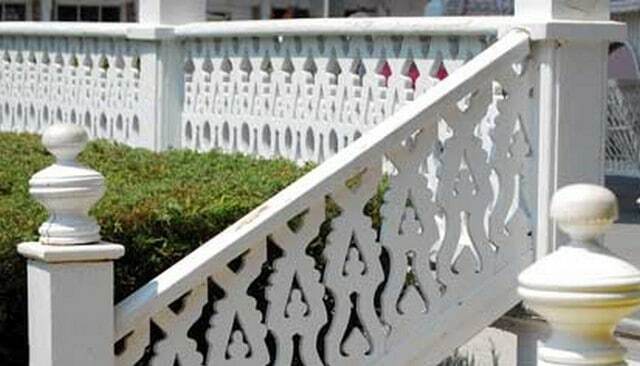 This intricate colonial style sawn baluster guardrail integrates numerous motifs including the exclamation point, crosses, and fleur-de-lys. This pattern shows what gingerbread can mean in the context of architecture. 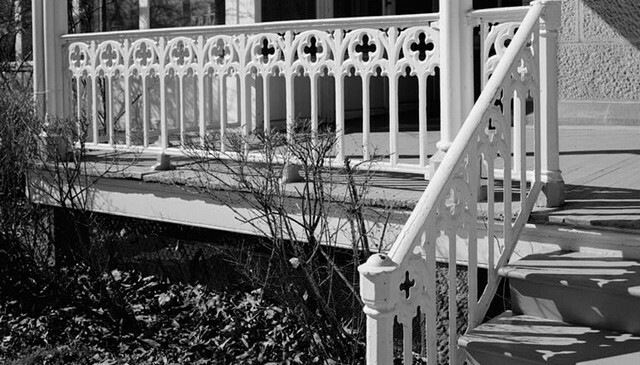 Multiple cross shapes are incorporated in a fanciful porch handrail. 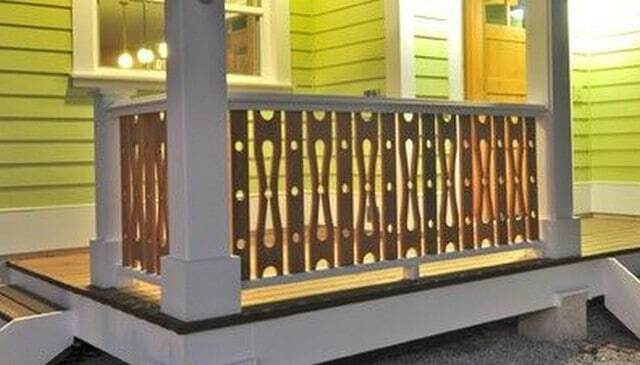 This porch stair railing is striking with multiple colors and sawn balusters cut into modified oval shapes with extended ends. 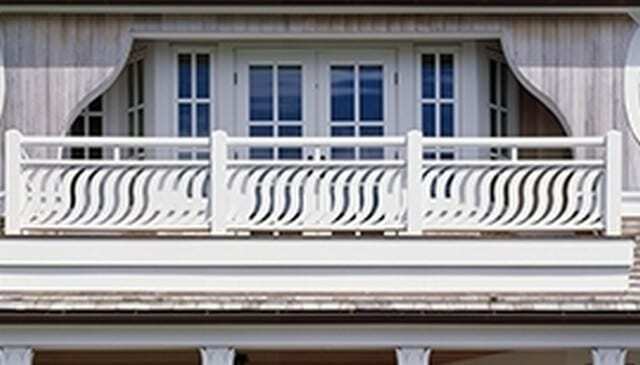 These flame-like front porch railing’s sawn balusters demonstrate that handrail designs really can be infinitely adapted and there’s no excuse for going with a boring railing. 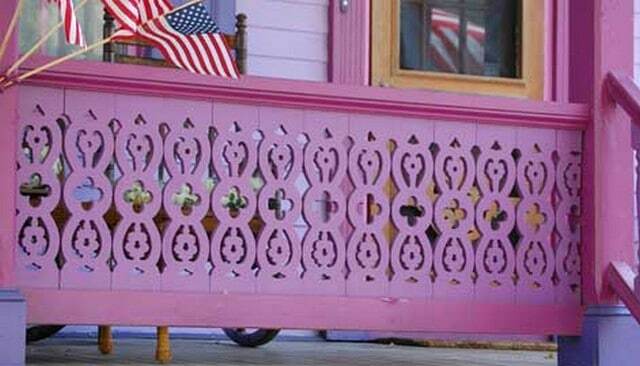 Another Gingerbread deck railing design picture with a very intricate pattern of crosses, hearts and diamond all painted bright pink to really stand out on this Victorian home remodel idea. Modified ovals are centered between six rows: two rows of small 1.5″ diameter circles, two of 3.5″ diameter circles, and a row of half-circles connected to the top and bottom rails. 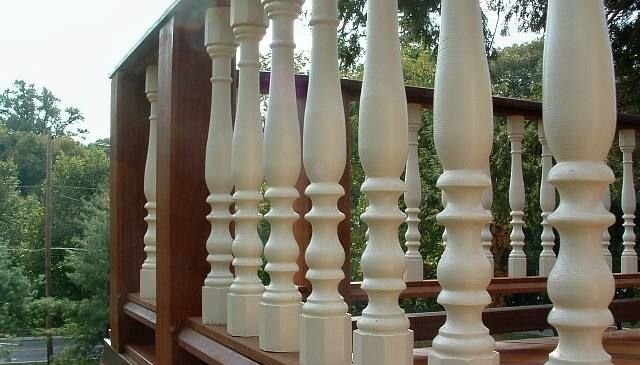 This uniquely designed sawn baluster handrail features multiple colors as well as the balusters which… are really difficult to describe in just a few words. 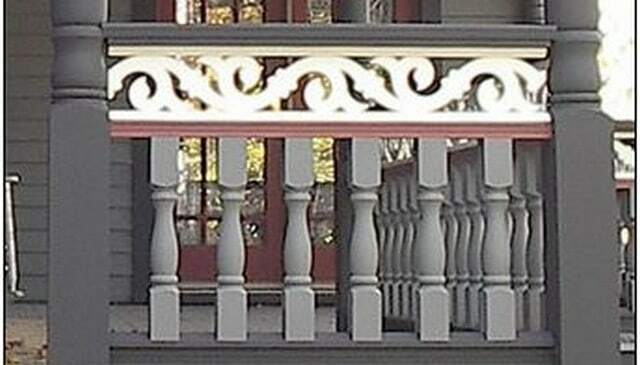 This extended oval sawn baluster deck railing design for home extends almost all the way from the bottom to the to rail and is capped on either end with a small circle, looking like a circus clown balloon. 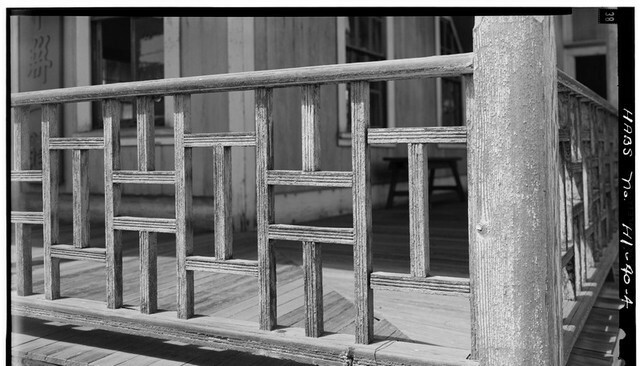 These sawn balusters make a pattern with a row of central alternating up and down hearts which are probably 18″ in height. There is a row of small crosses above and below. 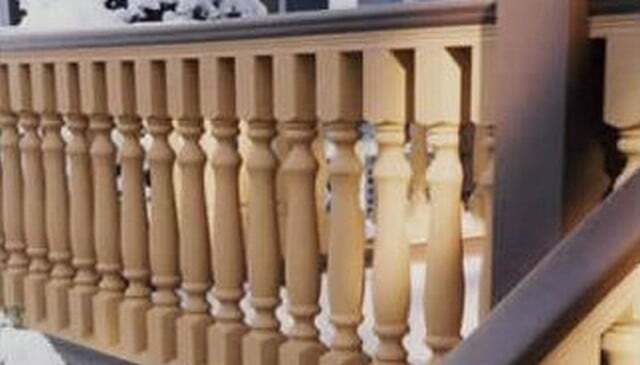 The pregnant baluster gets its name from the profile view which is somewhat reminiscent of the profile view of a pregnant woman. Here, the top and bottom are painted a different color. Trompe l’oeil is a French term which means “to fool the eye”. 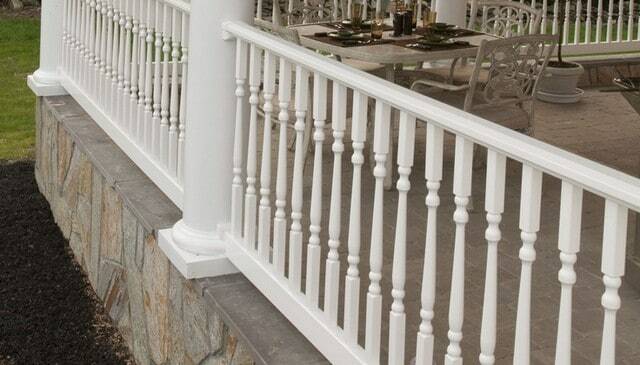 In this handrail, cut balusters leave an opening which looks like turned balusters alternating with 2×2 pickets. This brick porch receives the Colonial treatment with wood trim decorated posts and classic turned balusters and the early morning sun in this picture. 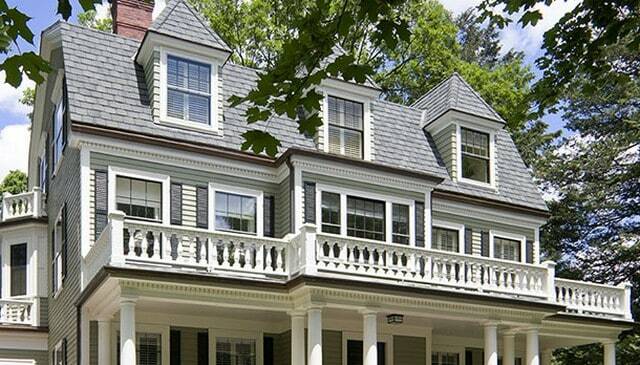 This Colonial Revival home with a gambrel roof and elaborate cornice details, also features an elegant turned baluster deck railing painted trim white. A historic picture from before 1933, this balustrade shos signs of decay but also the elegant styling of nicely proportioned turned balusters with square bases. 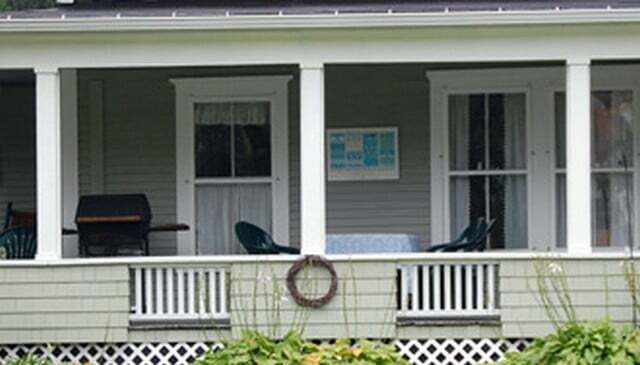 The turned balusters in this picture are the same size as a 2×2 picket. 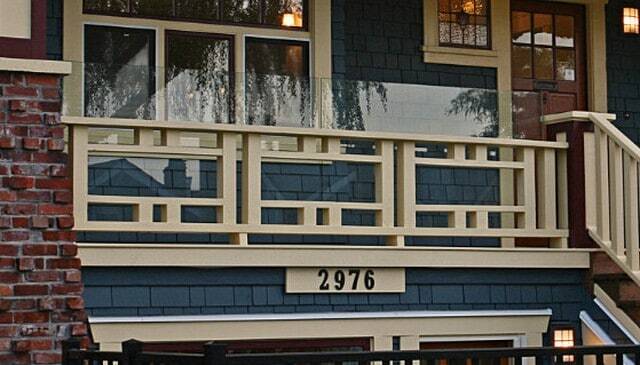 Since the profile is not very pronounced, from a distance these balusters are nearly indistinguishable from 2x2s. This is simplistic turned balusters with minimal fluting and square bases and tops somewhat extended perfect for making an understated impression on this home. 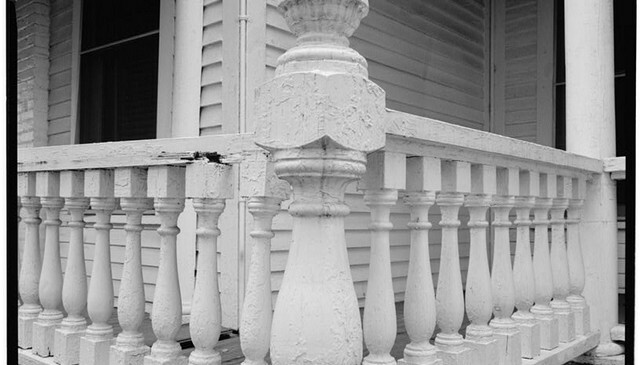 This photo shows the classic Victorian style turned baluster with slender width and correct proportions on the square caps. 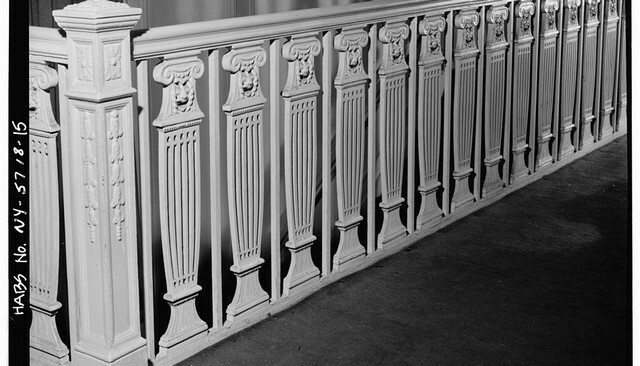 Turned balusters are shown here that have octagon bases and caps instead of the typical square. They are also more ornate with multiple curves and flutes. 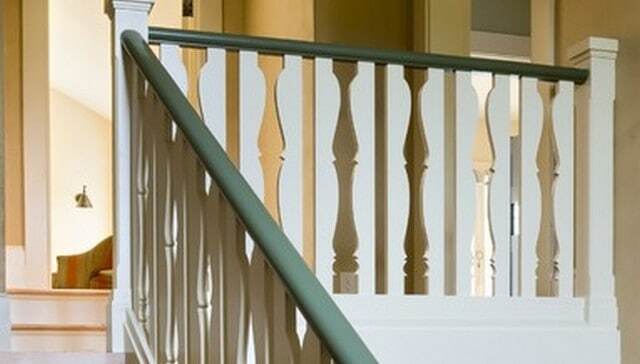 This stair railing picture shows a Grecian urn style turned baluster. The typical tuned neck springs from a shape that looks like a classical Greek pot. These turned balusters are ornate with multiple flutes top and bottom but also have a somewhat spare curve on the main section of the spindle. 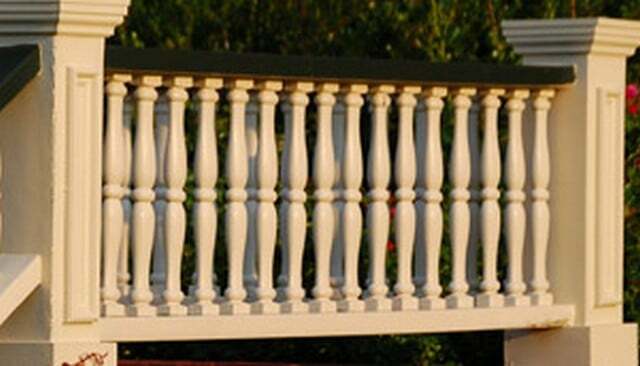 Contemporary turned balusters are slim and slender with strong symmetry. 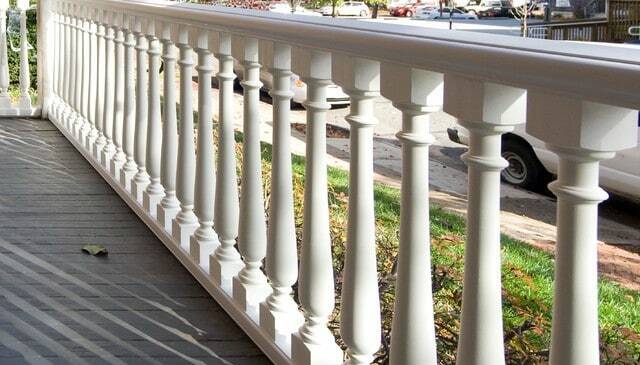 This white patio railing idea and the matching posts complement the porch floored with pavers. 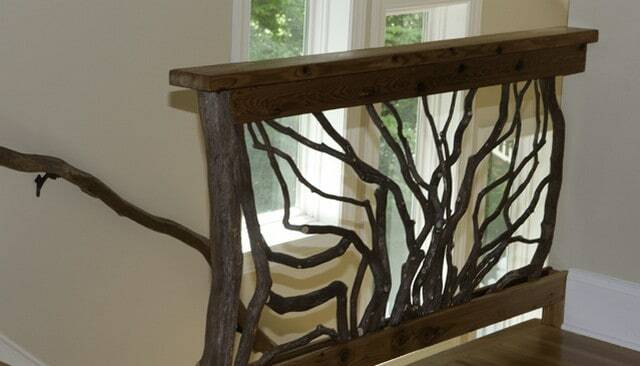 This sunburst style branch handrail is nicely matched with the window beyond which lets in the natural sunlight to go with the natural wood branches. 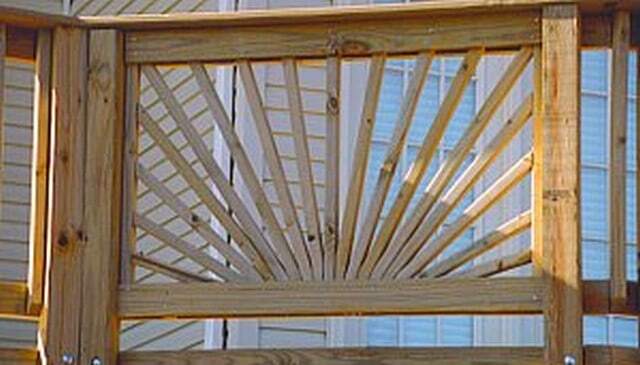 The standard pressure treated 2×2 sunburst is a good do-it-yourself project and you can quickly learn how to cut a sunburst railing in the most accurate way. 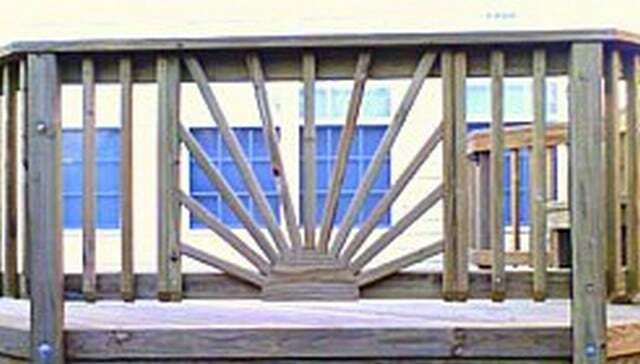 This wooden deck railing idea uses a sunburst with vertical 2×2 deck balusters on either side and a jigsaw cut circular piecetape as the sun at the bottom of the panel. 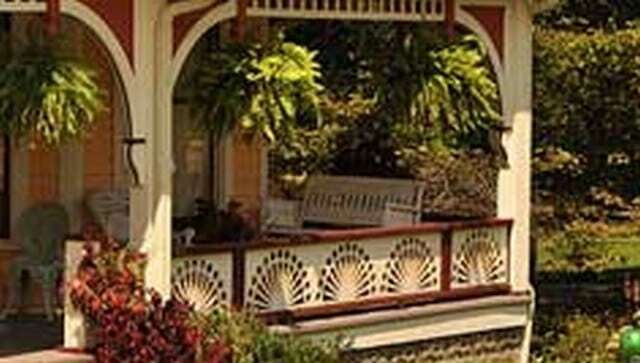 A variation on the sunburst pattern is this circular fan porch railing. The sunburst is jigsaw cut teardrops with circles around the circumference. 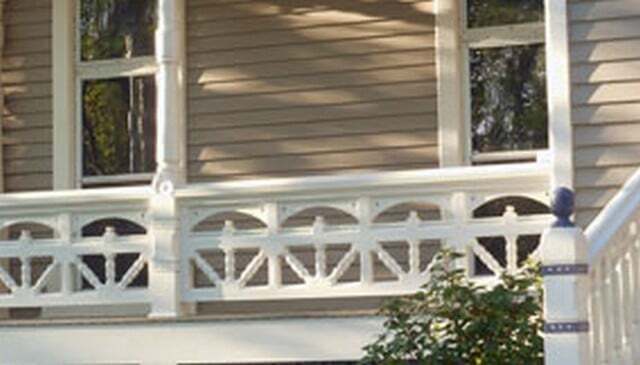 A victorian porch features this multiple sunburst railing featuring multiple three-pronged parts each crowned with an arc in a single post to post section. 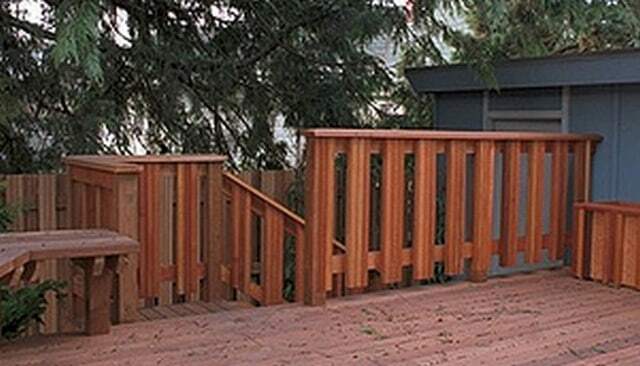 A better pressure treated sunburst railing uses 1×4 boards that are milled with a saw to taper to a narrower width at the center and be fatter on the outside. 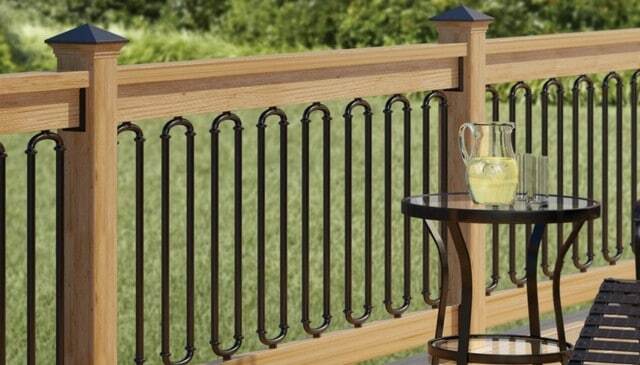 This sunburst piece is the segue from the wood railing ideas for decks to the metal railing ideas. This unique section is an off-center metal disk with metal pieces spiraling out like a nautilus. 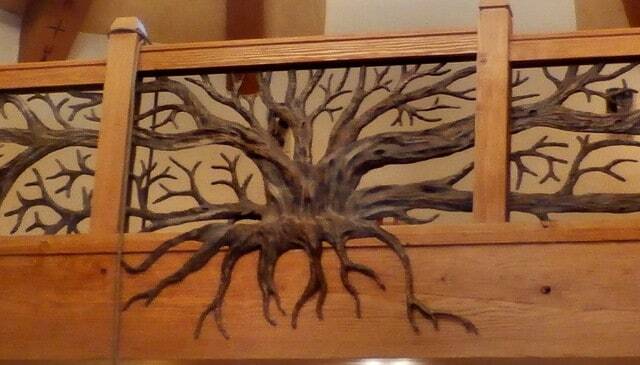 This forged bronze metal tree grows from the floor beam on this balcony and the limbs stretch from one wall to the other in a remarkable work of art. 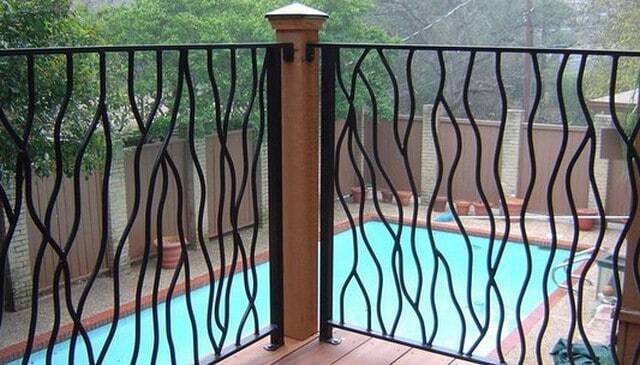 These metal balusters incorporate sinuous curves above a strong outward angle before coming down to the bottom rail for another of these metal deck railing ideas. 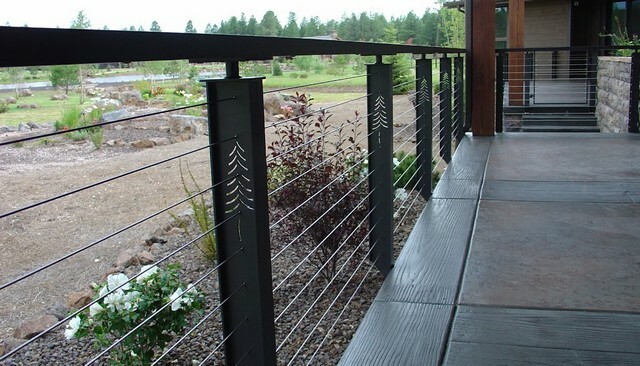 This cool deck railing option showmetal balusters angled outward and to the right while light blue metal panels with a strong opposite angle are placed every other opening. 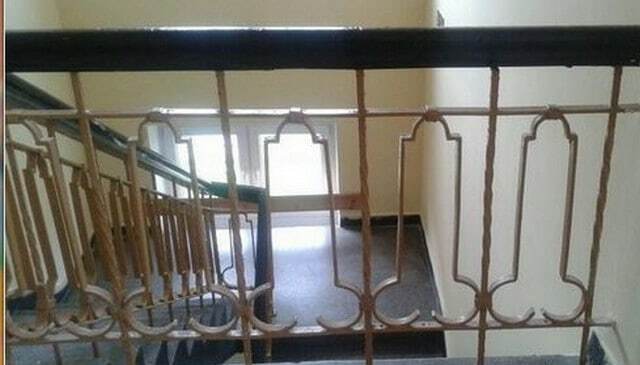 This art deco metal railing panel style is apparently quite popular in Bucharest, Romania. 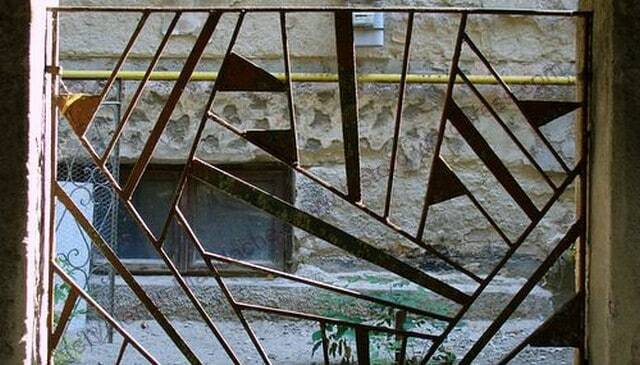 The metal lines and triangles are randomly placed for visual excitement. Black metal handrail caps vertical metal balusters spaced every 3″ with a diamond insert at the top of alternating baluster openings. 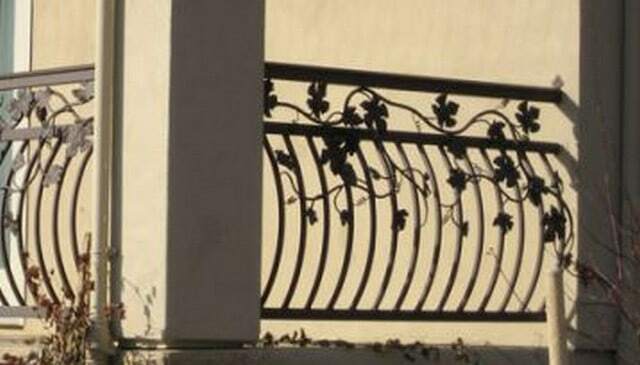 Metal balusters arc to the outside with a solid metal top rail spaced about 8″ above the panel and metal grape vine and leaves ‘growing’ all over the railing. 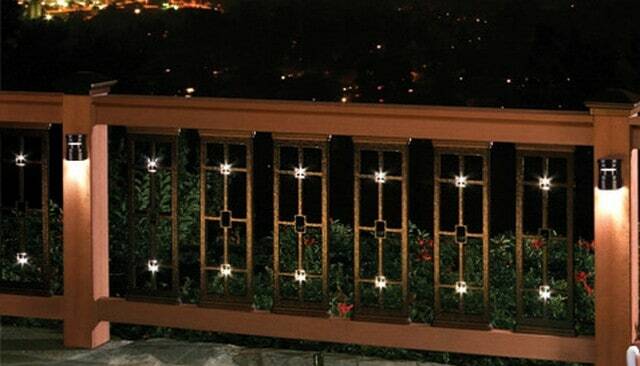 Metal balusters hide a surprise with LED lights to make a real show when the sun falls. This presents a whole array of choices in style opportunities. 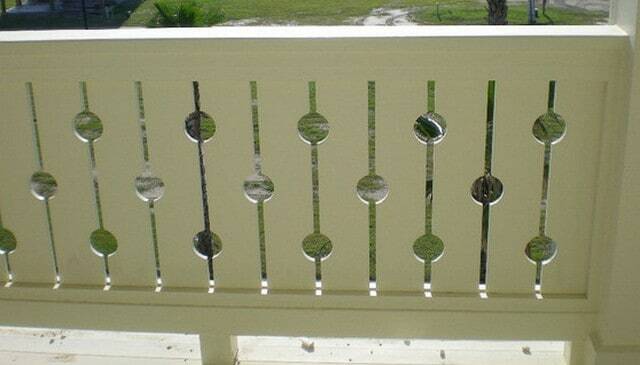 Circles of many different diameters are arranged in random patterns on this modern railing in a manner that is suggestive of foam or soap bubbles. 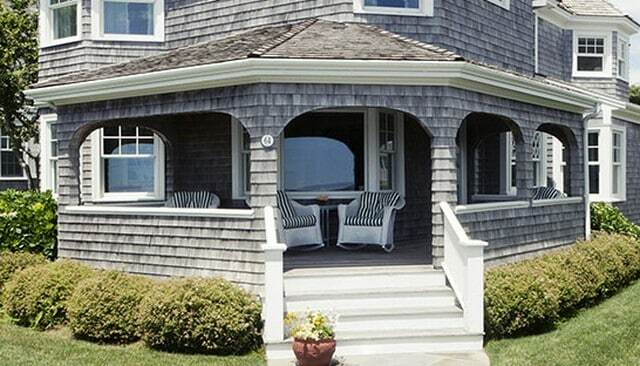 This Cape Cod home overlooking the bay and sailboats moored features a craftsman style metal outdoor railing with vertical and horizontal elements and and emphasis on spacing. 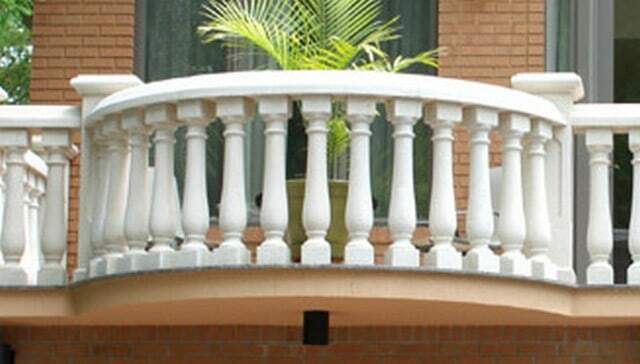 Square metal pipe railings with vertical balusters below triple horizontal top rails are attached to the face of a stone balcony which curves away in an arc. 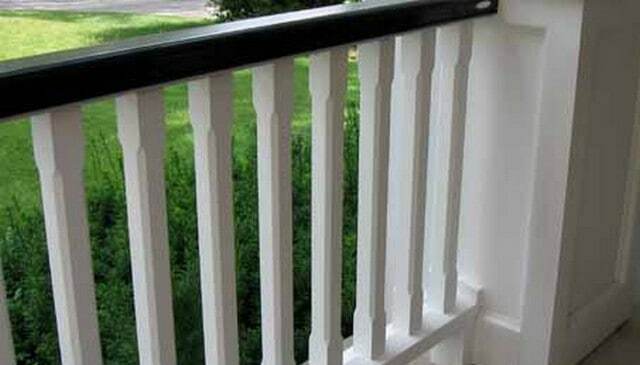 This is a simple variation on the vertical baluster style showcasing a double top rail connected midspan with two small vertical balusters. 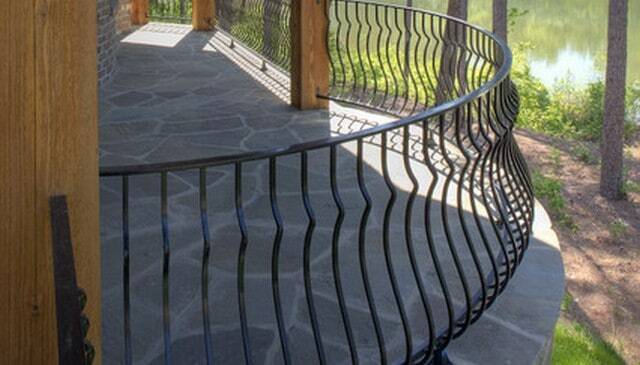 This curved metal railing features balusters which also look like the so-called “pregnant” balusters in that the profile resembles a pregnant woman. 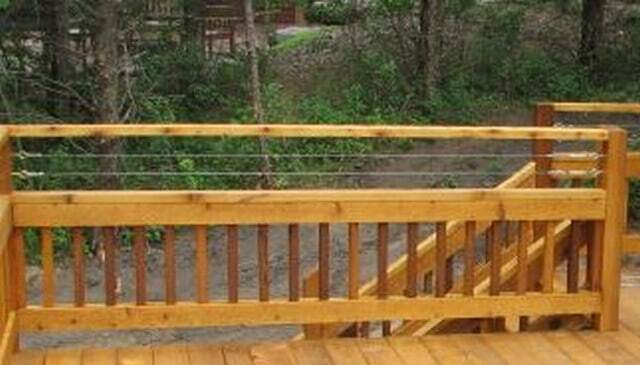 This simple deck railing design overlooking the water features horizontal metal pipes connecting pressure treated 4×4 posts capped with a wood handrail. 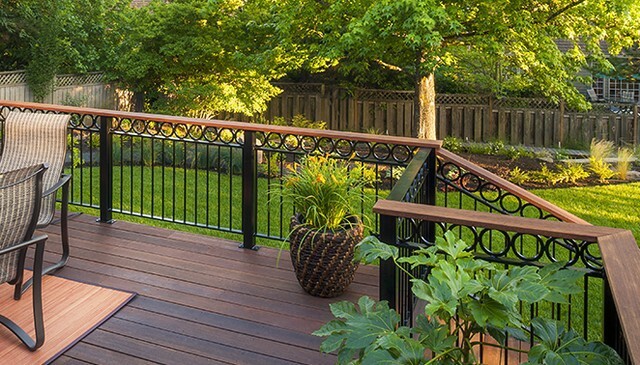 This wooden deck has black metal posts connected by vertical metal balustrade sections which are capped with a row of 4″ black metal circles and a tropical hardwood top rail. 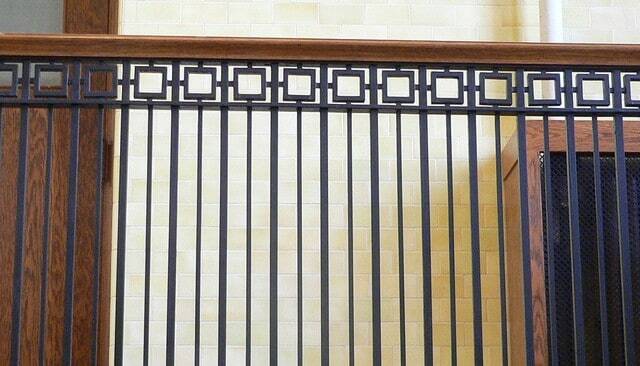 A craftsman style railing in a courthouse has black metal balusters of alternating width topped with a row of smaller squares and a dark stained wood cap. 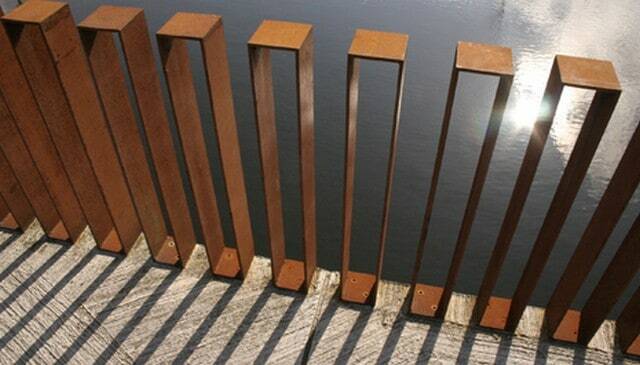 Horizontal and vertical metal slats intersect at different heights to make a stair step pattern in this creative railing design picture of these modern deck rails. 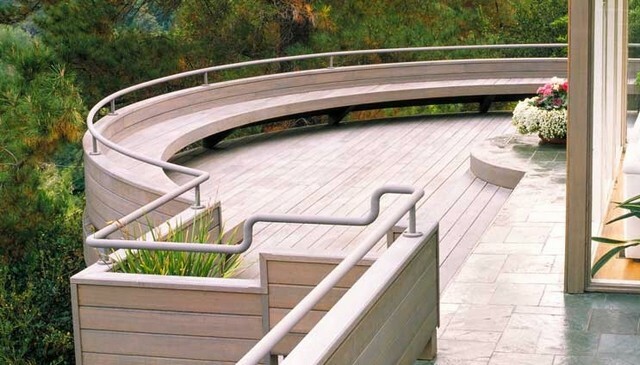 Jaggedly curved metal balusters are combined with thin balusters to make an overall effect so these deck handrails look like a waterfall in a constant state of motion. 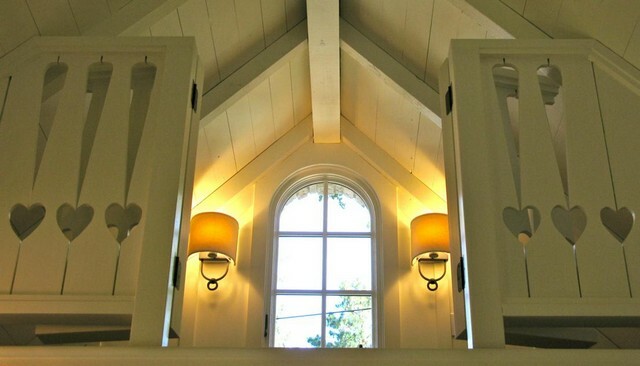 Craftsman style metal panels make square shapes in the guardrail opening and are lit at different points with small lights to go along with the downlights on the posts. 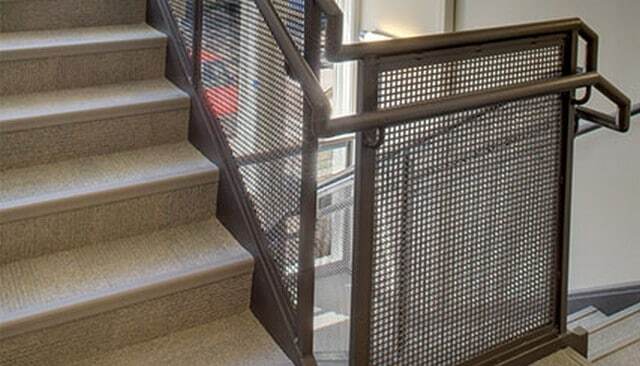 Metal balusters are spaced gradient style from one end of the panel and alternate panels are rotated 90 degrees between up and down or side to side. 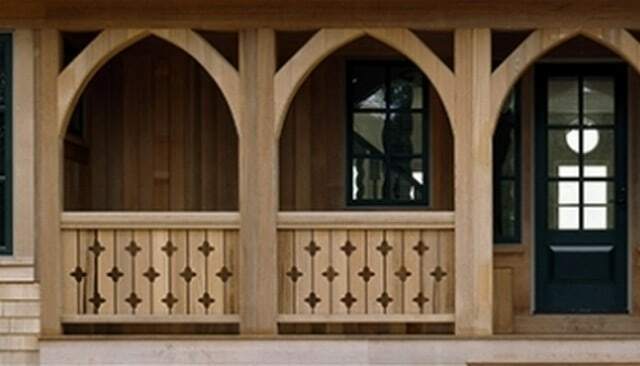 This Art Deck style metal railing is imbued with Gothic essence through the use of pointed arch shapes which evoke the great medieval cathedrals. 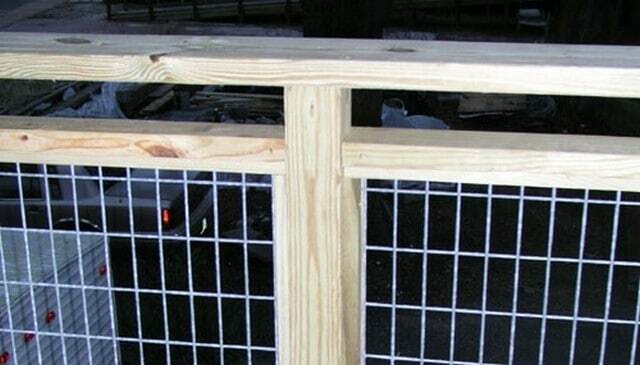 Regular galvanized metal 2×4 fencing is framed with pressure treated 2x4s and a continuous 2×4 top over 4×4 posts. 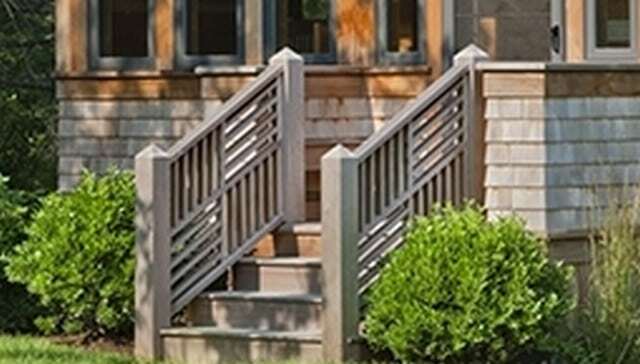 A square metal 4″x4″ grid is capped by an open space and a stained wood handrail in this contemporary front porch stoop railing. 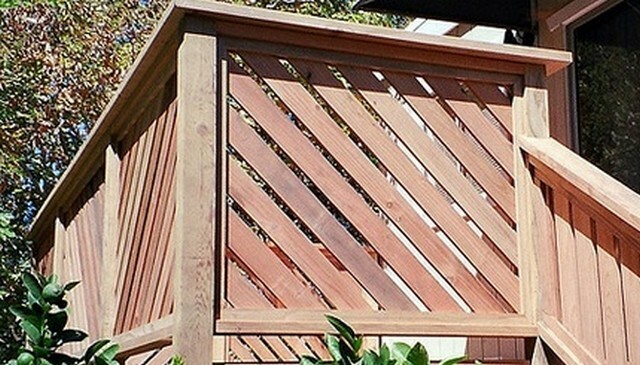 This grid pattern features metal slats instead of square pipe and the grid openings are more rectangular than square to complement the chosen material profile. 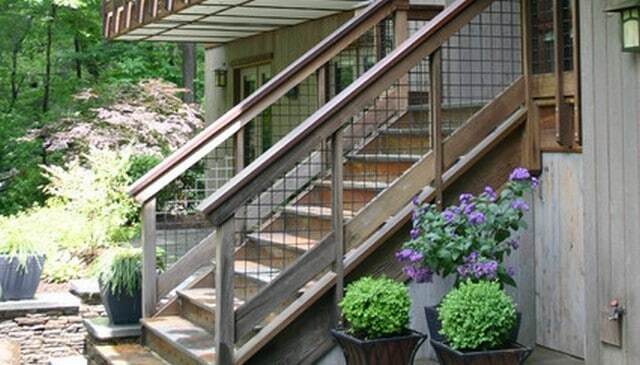 The bottom rail on this deck stairs railing is a 2×6 turned on edge with 4×4 chicken wire infill. The bottom rail could have been placed directly on the small kneewall. Black 4×4 wire metal grid gets the minimalist treatment with black metal pipes in a very spare style on this ipe wood deck floating in the trees. 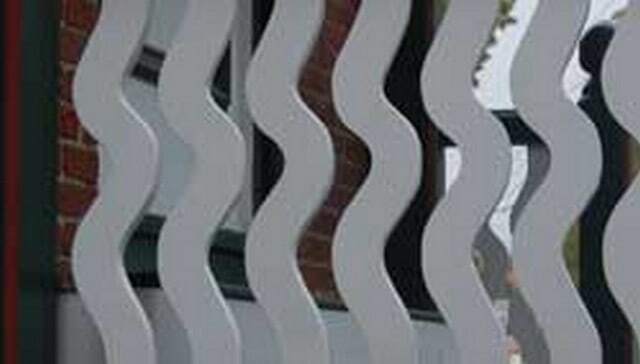 Fine wire mesh strung in long runs in framed openings gives the appearance of being invisible or virtually see through from some directions and not others. This wavy metal railing uses undulating lines to create the appearance of waves to match the watery backdrop all under a wood top cap. This style screams Gothic revival with the strongly pointed and interlaced thin arches set over diamonds in squares cut out of a solid background. 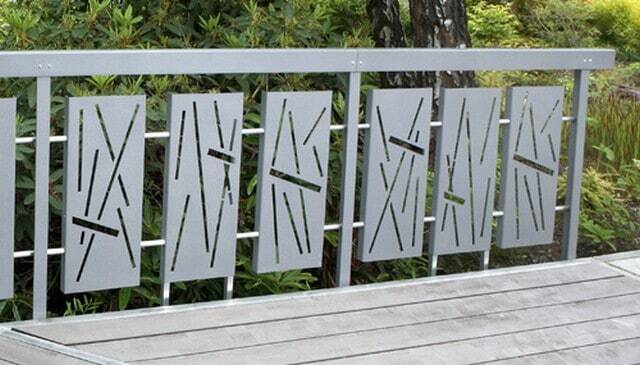 Abstract lines on metal panels in series of three capped with a rectangular profile metal all with the scenic rhododendron forest behind. 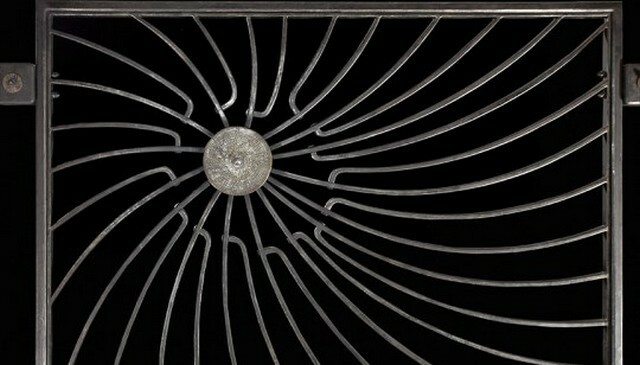 Wrought railings turn circles in this pattern with interlaced central circles where the intersections are circles with a row of small circles at bottom and top. 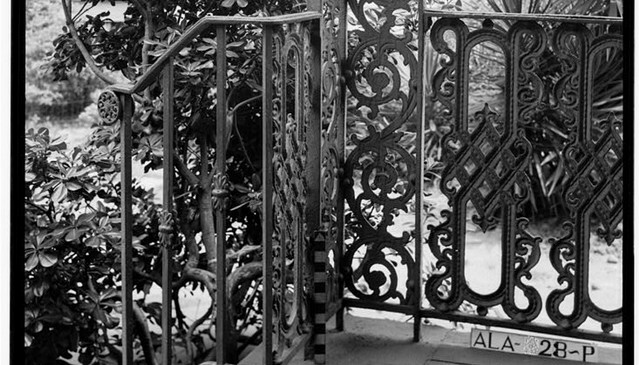 This colonial mediterranean wrought iron railing is decorated and stylized with arrows and fleur-de-lys such that it has a look of multiple tridents. 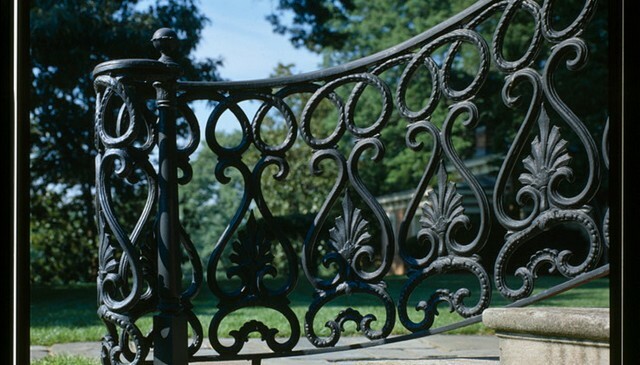 This extremely ornamental wrought iron handrail is really beyond the ability of words to describe except to say that there is more pattern than open space. 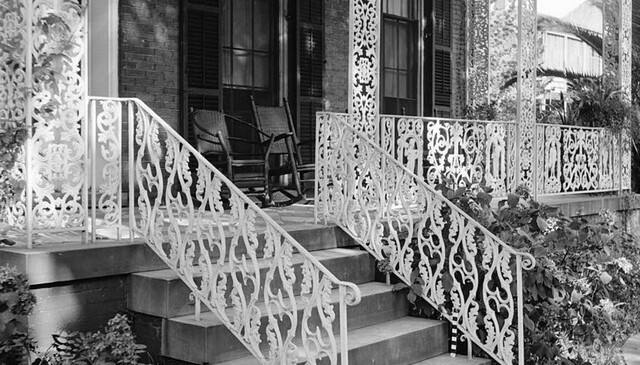 Vertical metal balusters are crowned with alternate cross and arrow motifs on this historic photograph of the Washington DC Soldiers Home. 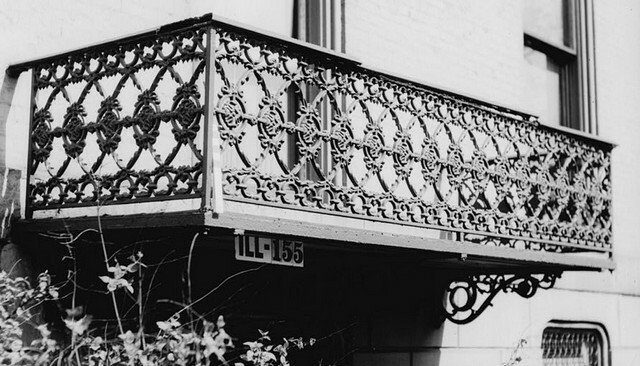 This type of elevated stairs is a architectural relic which did not have such ornate iron railings and allowed people to exit the horse-drawn carriage without dirtying their feet. 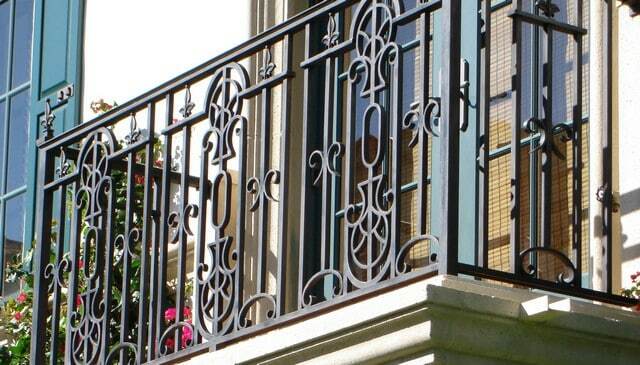 Ornate wrought iron railings are another option for creating a custom guard rail. As seen in this picture, it’s easier and more economical to do a repeating pattern over some length. 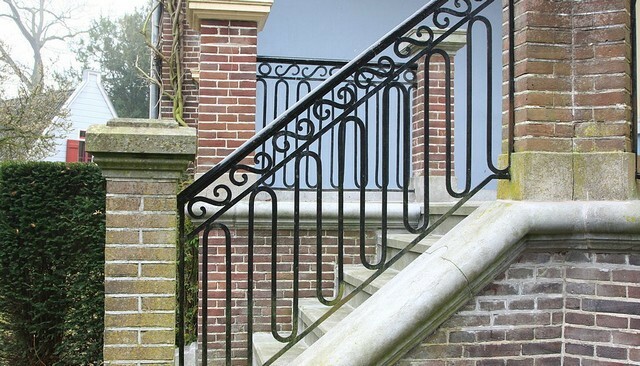 These black iron ovals are pipe shapes and give the appearance of vertical balusters and accompanying ease of installation but also give some comforting curves. 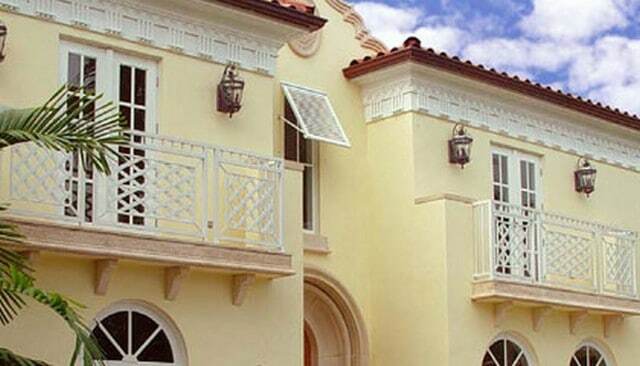 This Palm Beach Carribean chippendale deck lattice idea shows a framed metal diamond lattice central section with small verticals above. This is an actual photo of a real IRS building thanks to Reddit there are all kinds of amazing images available for the viewing public to browse and comment. 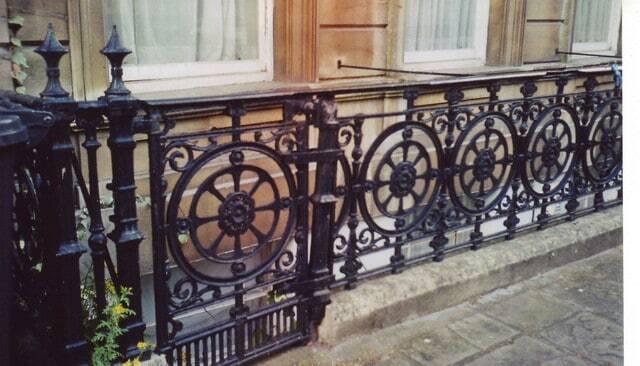 Historic wrought iron is a work of beauty with multiple patterns in a highly ornate style and posts that are metal and feature similar workmanship. 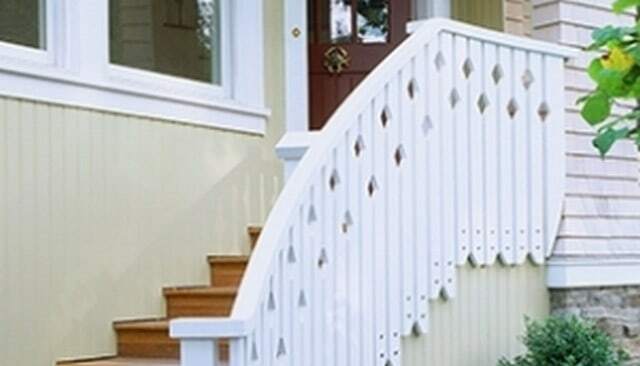 This porch railing and stairs handrail is displays a pattern of rightside up and upside down hearts with a vine and leaf motif and amazing wrought iron posts. 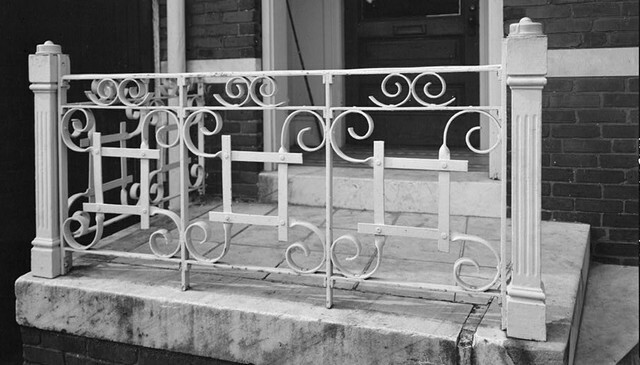 This iron railing is similar to a Grecian urn style with spade and trident shaped figures topped by a coiling metal rope across the top with open volute. 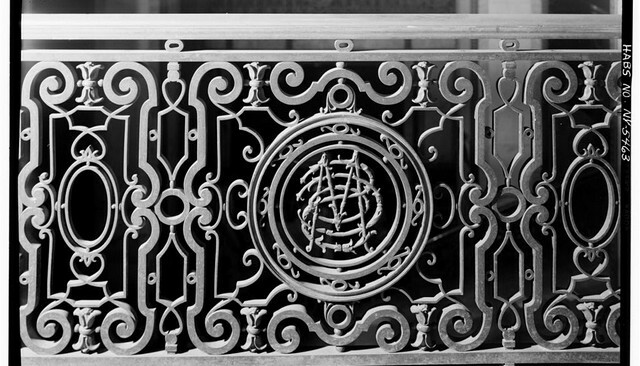 The historic handrails featured here come from the Library of Congress where some truly amazing pieces of architectural history are stored as photographs. These extra-tall metal balusters resemble decorated columns of the Ionic order perfectly fitting for the old Morosco Theater in New York City. This intertwined and sinuous metal railing seems to be inspired by the natural and organic shapes of rustic wood branch railing. This home’s front porch railing marries square, rectilinear forms with spirals and curlicues in a shape somewhat like the “#” symbol. 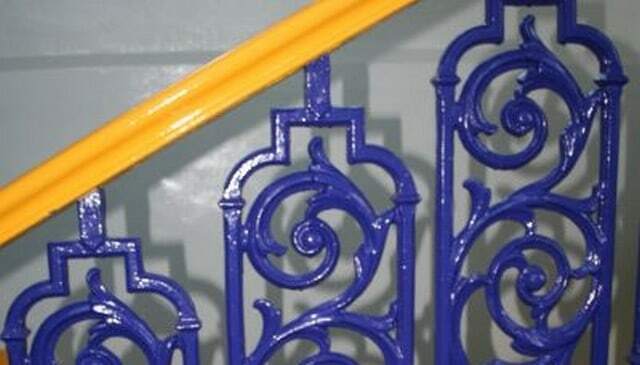 This stair railing features repeating vine and circle motif balusters that have been painted blue while the top banister is painted a bright yellow. 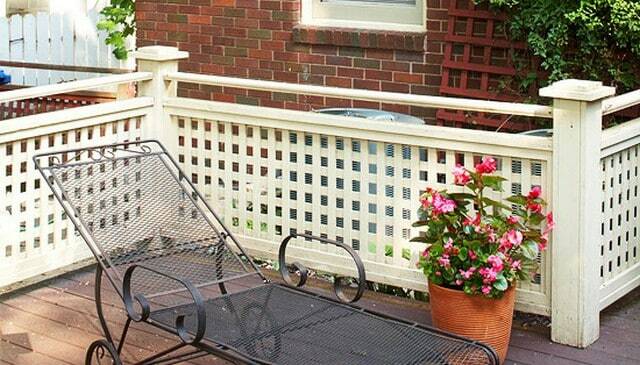 Two simple patterns are joined on this brick front porch handrail and stairs railing. The main field is an up and down squiggle with modified sideways figure 8s above. 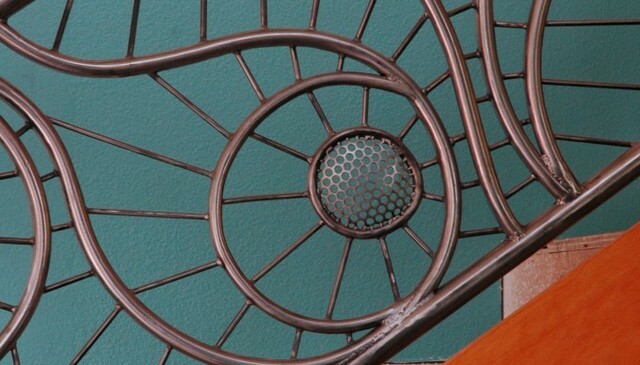 Another of the railing design ideas which involved some interesting geometry and difficulty in connecting the pieces is this circular metal. This deck overlooking a lake features arched metal newel posts mounted to the outside of the deck framing with a wood cap. Keuka Studios Tokyo Style cable railing has I-beam style posts side mounted with pine tree shapes cut out of the web of the post. 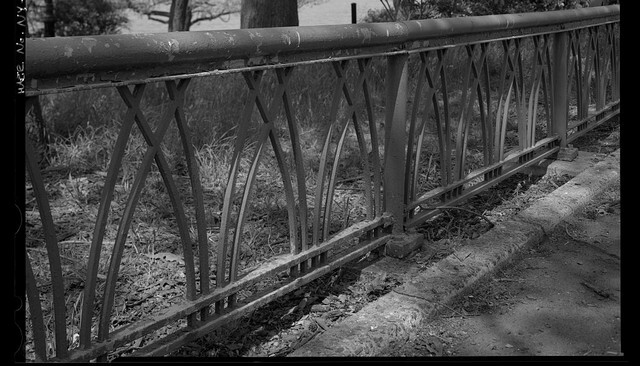 Metal pipes are used here as the support posts and cable wire railings are strung in between for and interesting look. 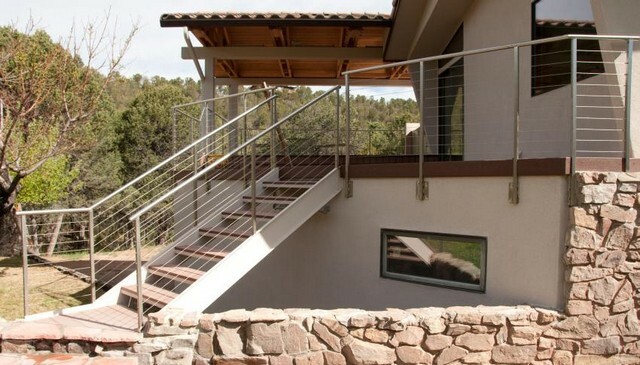 Cable railing is strung all in silver between small diameter square metal pipes with only a round metal pipe for a sparse minimal contemporary architecture on this deck stairs idea. Cable railings are mounted between stainless steel pipes on top and bottom which run between white post covers and caps. This stair railing has cable railings running up and down from alternating points to make a continuous squiggle across the field of the guard rail. 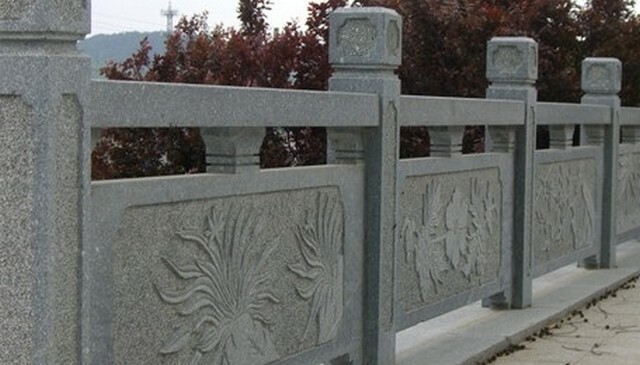 Stone balusters on this bridge railing are decorated with an otnate pattern while the posts receive a special tile treatment. Definitely not a DIY project. 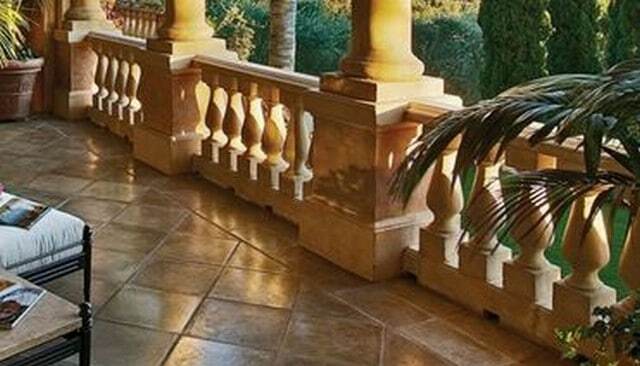 Stone turned symmetrical balusters are centered between two panels of solid infill on this Tuscan style master suite sunset porch. These simple stone balusters are shaped in the Grecian urn style with a larger diameter bottom that narrows and then flares out at the top. 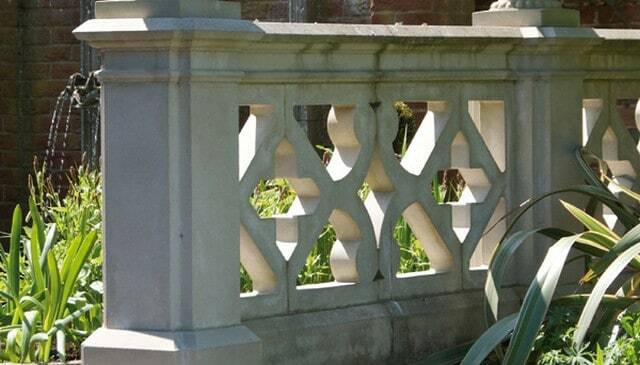 These stone balusters are heavily weighted with a large diameter that shrinks rapidly to a fluted column top by a ring of studs. Obligatory Cats on a Railing – Historic! 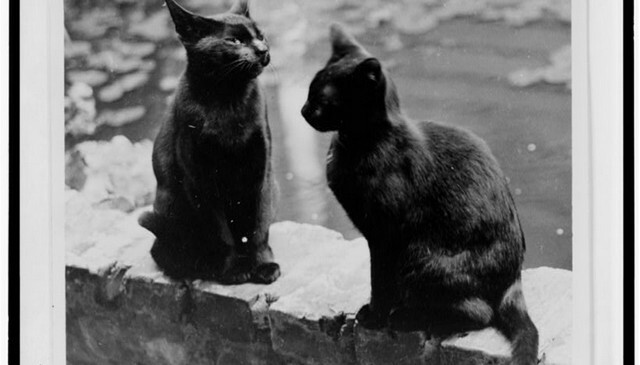 Two cats, Herman and Vermin, are seated on a brick railing of the New Orleans home of Frances Benjamin Johnston, and early American female photographer, in a picture taken between 1920 and 1950. The ornate pattern on the Washington Bridge is a testament and tribute to all of the workers, crafters, laborers, architects and tradespeople that made it happen. 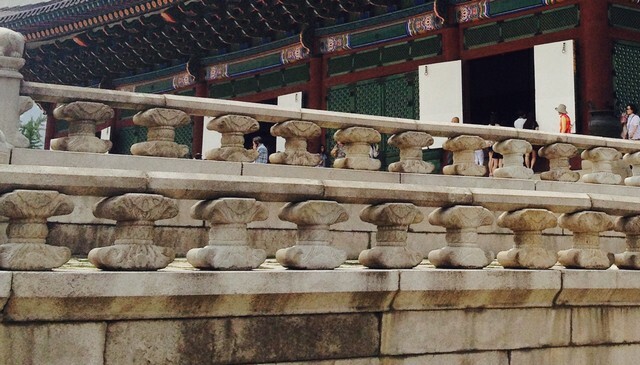 The stone handrail on this Korean castle gives a sense of what a monumental building material stone can be when integrated into a thoughtful plan. 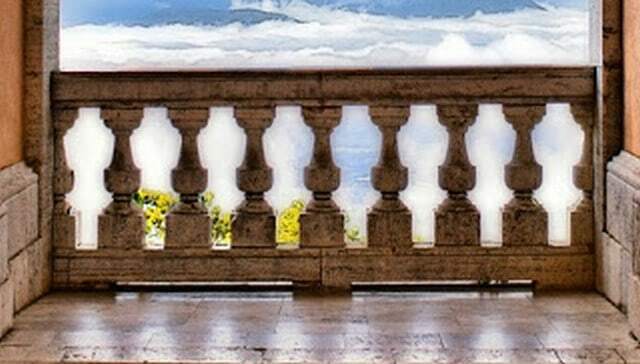 An Italian balcony overlooks the sea through finely crafted stone balusters. These have large bases with a turned and rapidly narrowing column. 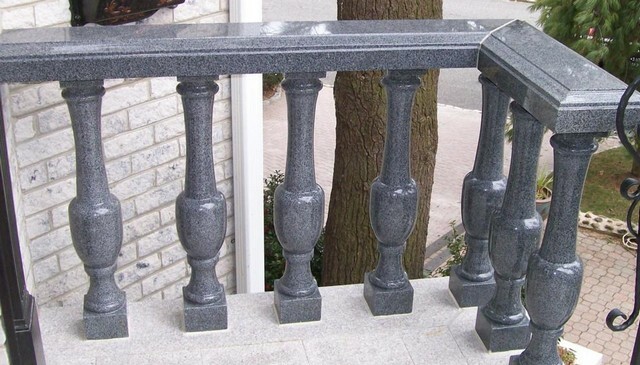 solid granite guardrail is decorated with various different carvings in this gorgeous outdoor railing design. 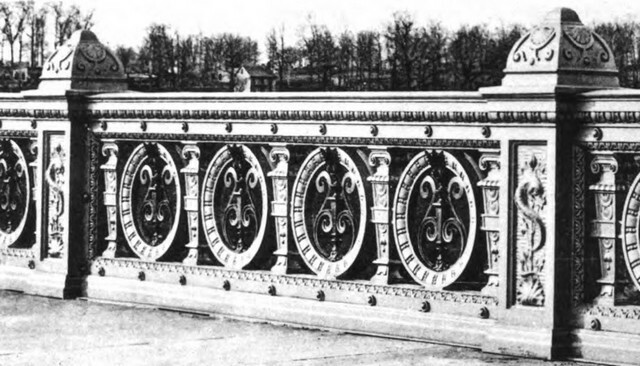 A garden parapet is decorated with multiple different modified X shapes and ornate multiple-profile top cap and post finials. 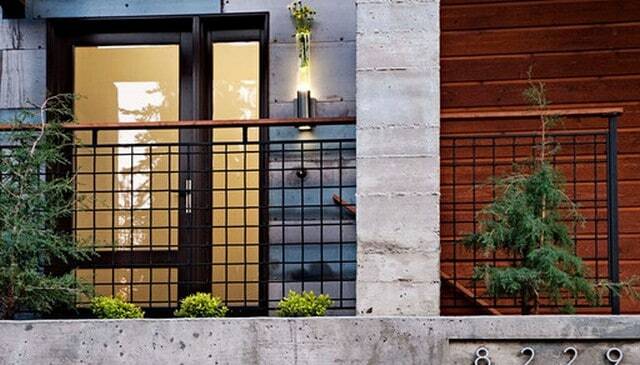 Slender turned railings in black marble adorn this front porch. They are really quite shiny in this picture. 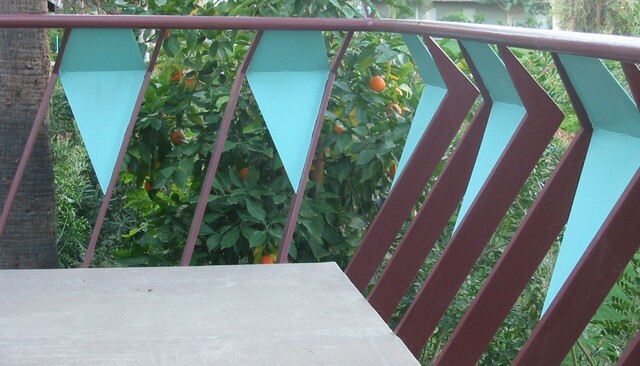 Precast concrete balustrade systems can be used like on this balcony railing and painted multiple colors. 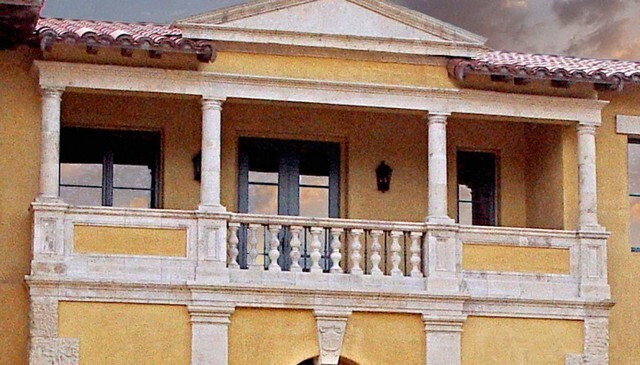 Precast concrete is lighter and more versatile than stone. 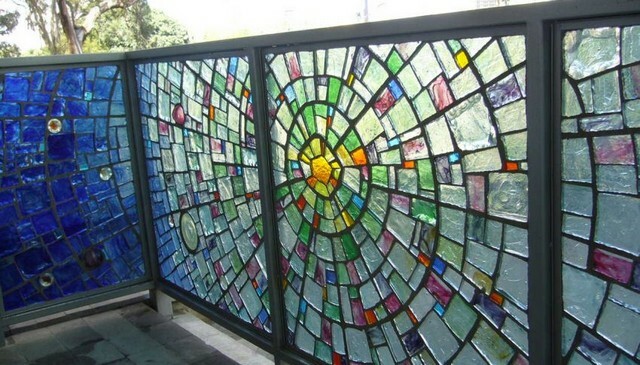 This stained glass railing is in the shape of a circle radiating out from a central point like a mandala. The effect is lovely with the colored tiles darkening away from the center. 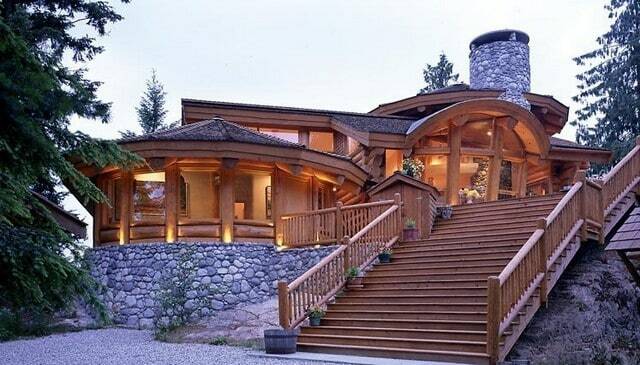 This rustic home has rock siding and a cedar shake roof. 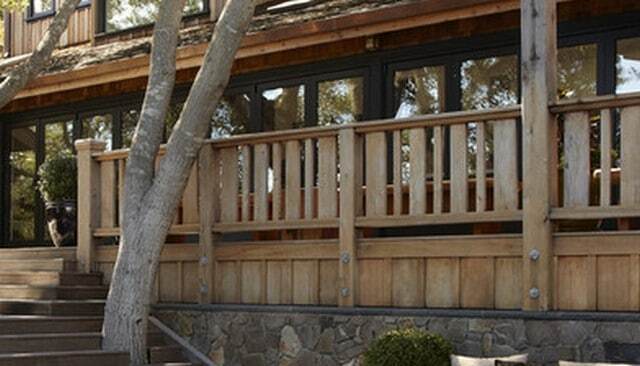 It also has a glass panel handrail with rustic wood posts and rails which matches the window wall and lets the view in. 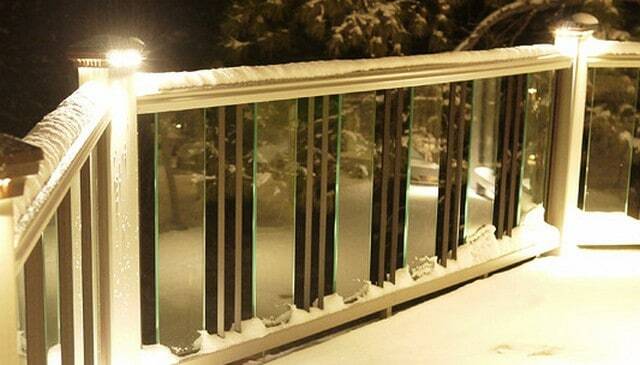 This frosted glass patio handrail shows how glass can create a privacy effect while also letting some light through. 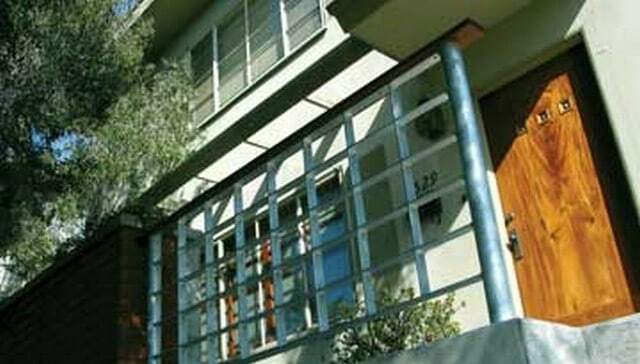 The panels are framed by metal posts and rails. 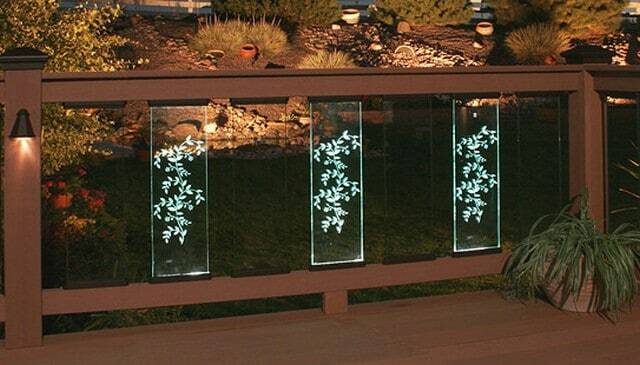 This glass baluster railing integrates LED lighted etched panels with a plant or vine drawing. 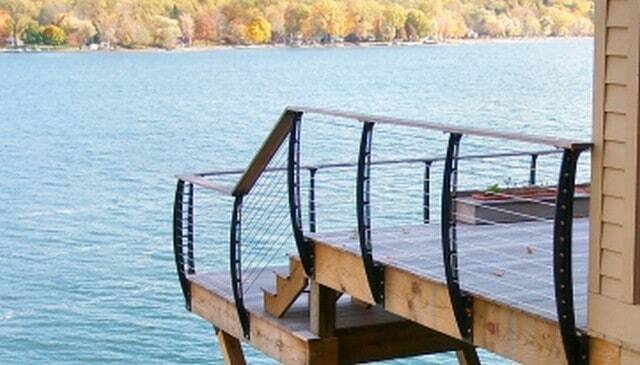 This is a great way to make a bold statement with your deck railing. Textured glass lets through more light and more of the view than frosted glass but since it is clearer, it is not as private and is more for aesthetics. 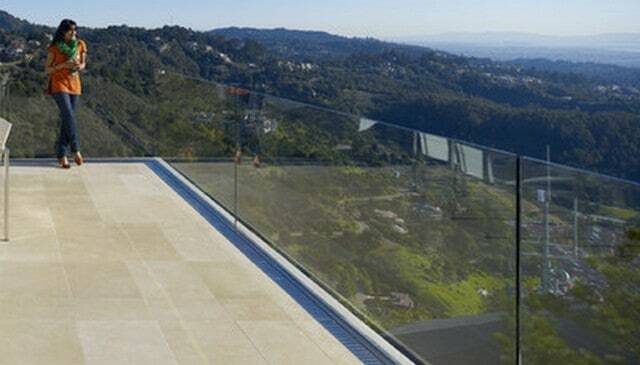 This glass panel guardrail has a long run of panels without any supporting posts capped by an a horizontal wood top that seems to be floating in the air. 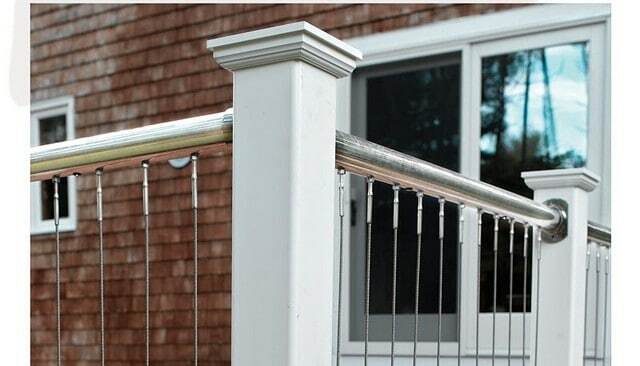 Glass balusters like these can be a stock item at home improvement stores and this is a great way to drastically change the look of your deck. These glass panels are suspended between the thinnest of supports giving the look of a completely invisible railing perfect on this modernist porch. 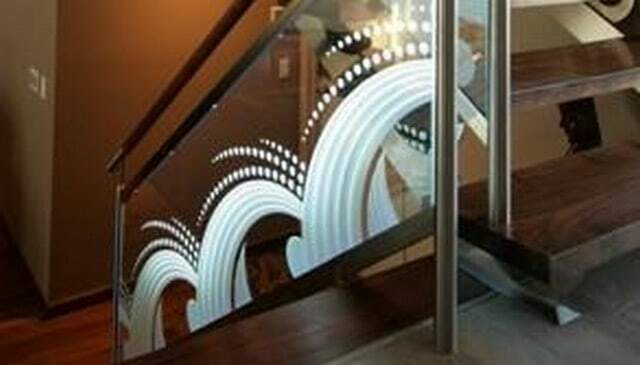 Glass panels are etched with an abstract design that looks like a rubber bouncy ball splashing its way down the stairs railing. 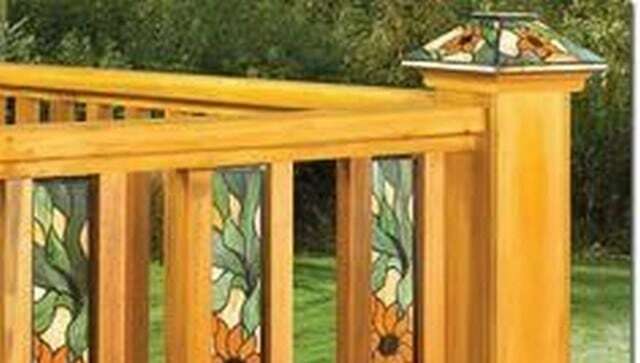 Tiffany style stained glass balusters are set into wood top and bottom rails and are matched by an accompanying post cap. 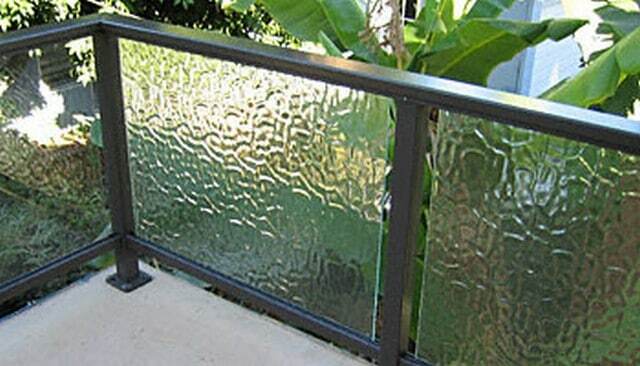 This glass panel guardrail utilizes a continuous metal top rail over framed sections of glass panels. 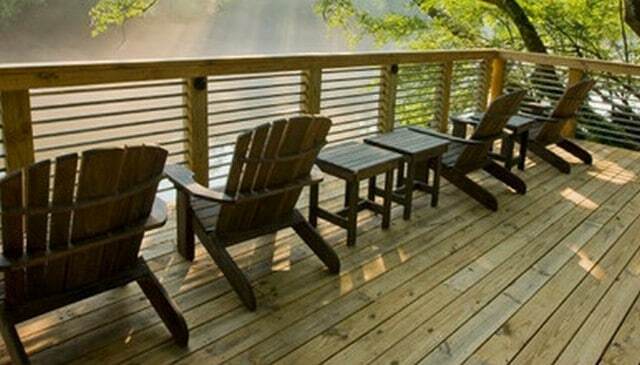 This deck overlooks the water and shows a beautiful sunset. 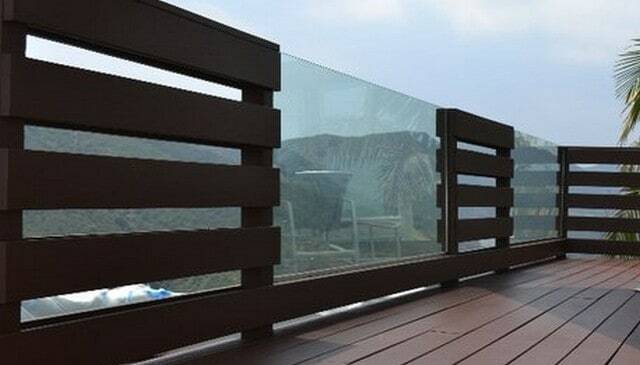 This glass panel railing also has a double top but this time the effect is more craftsman since the posts and rails are wood which has been stained a chestnut brown color. 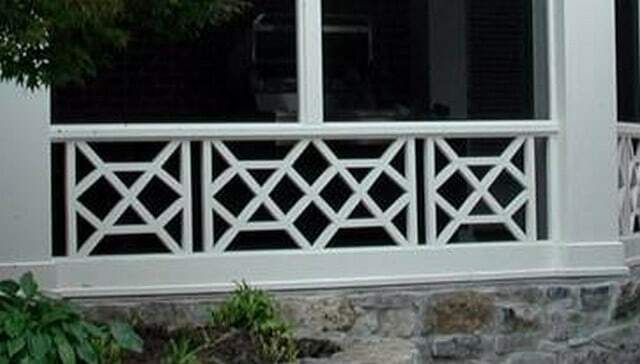 Solid wall railing is mixed with Chippendale double star inserts to let some light in and allow the breeze to pass through and cool the front porch in the summer. 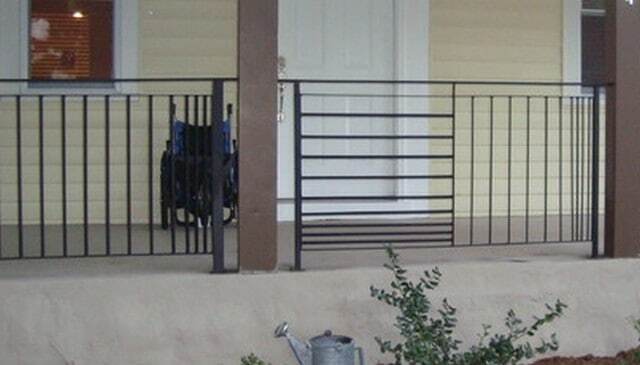 A good DIY deck railing idea, this project uses material available at all home improvement stores and lumberyards: 4×4 pressure treated posts and horizontal 1/2″ rebar. 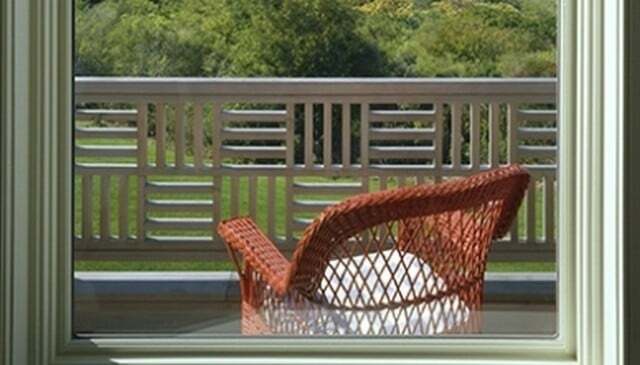 This wood deck bench railing has a metal pipe railing perched on top, bringing the height of the guard rail higher while also making seating and keeping the view open. 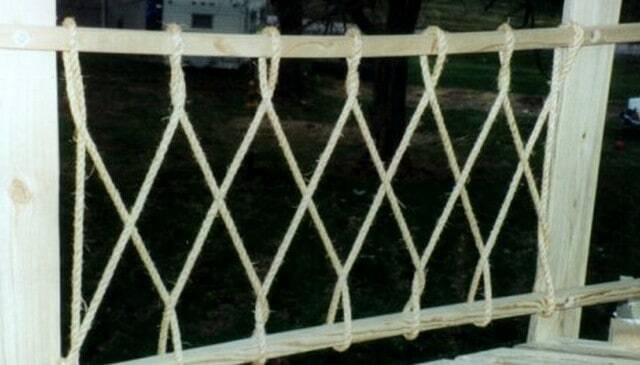 Rope is twisted in a whimsical diamond pattern on a pressure treated frame. 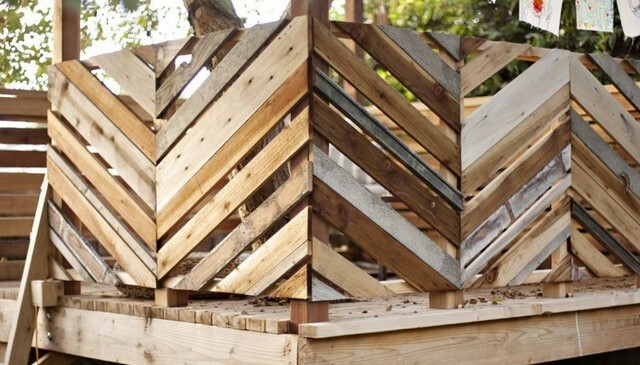 This is a great design for treehouse like shown in the picture. Rope is strung horizontally through holes in tapering, white-painted wood posts with a white trim board on the floor tying the whole thing together. 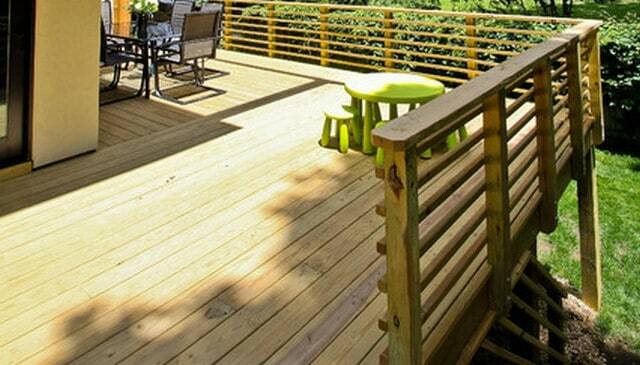 This deck remodel idea is composed of main sections of cable railing with formed metal radius corners capped by wood 1×6 top with taller posts capped with small tables. 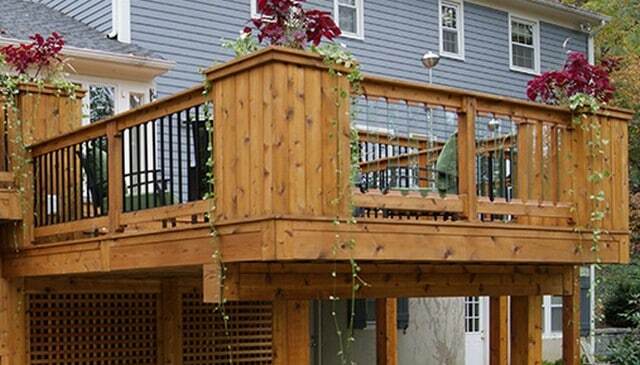 Metal balusters railing sections are mixed with sections of branch railing all built onto a framework of composite lumber on a deck built with composite decking. 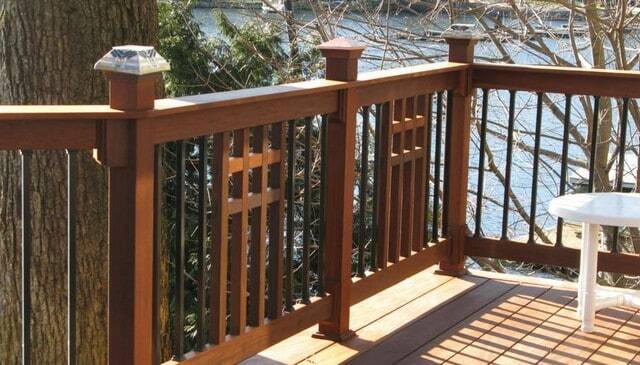 This ipe wood idea for a deck handrail encloses metal sections with craftsman motifs on metal pipe mounted to the posts that project behind the plane of the posts. 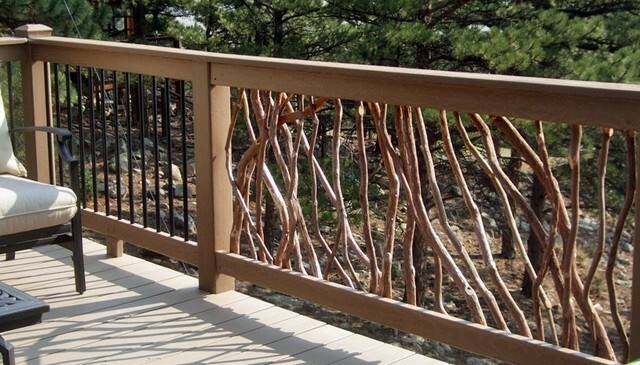 Mountain Laurel Handrail sections are mixed with sections of horizontal cable railing. 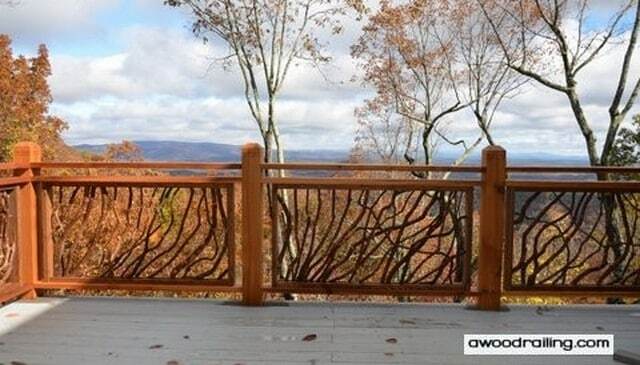 The cable railing lets the view through while the branches blend in. 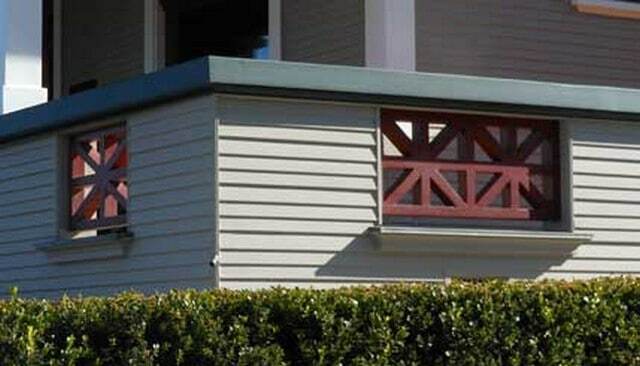 Horizontal boards in diminishing sizes are alternated with metal pipe in what is a truly eye-catching contemporary design for this porch and patio. 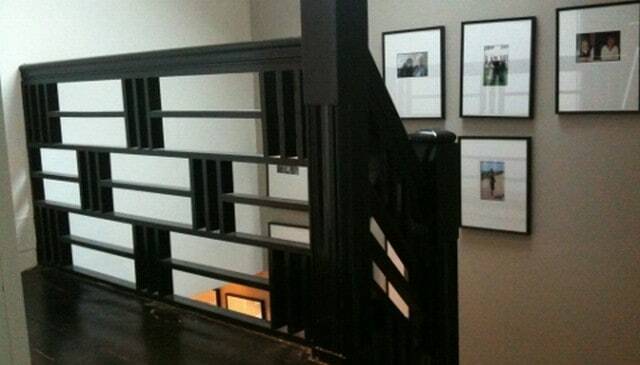 Metal Frame Railing with Glass above solid Hardie Panel sections topped with about ten inches of glass all framed in square black metal pipe. 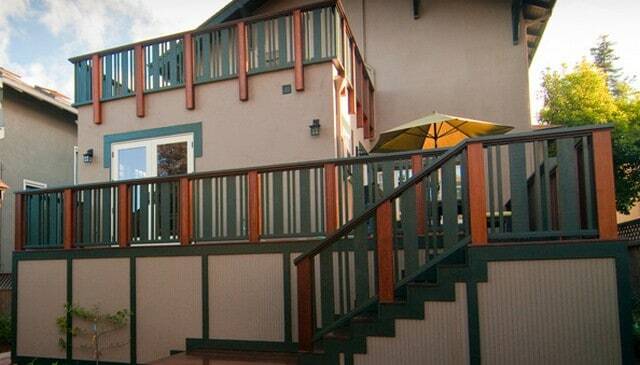 Mission style wood deck railing designs are flanked by metal balusters. The posts jut above the top rail and are capped with alternating glass led lights and copper caps. 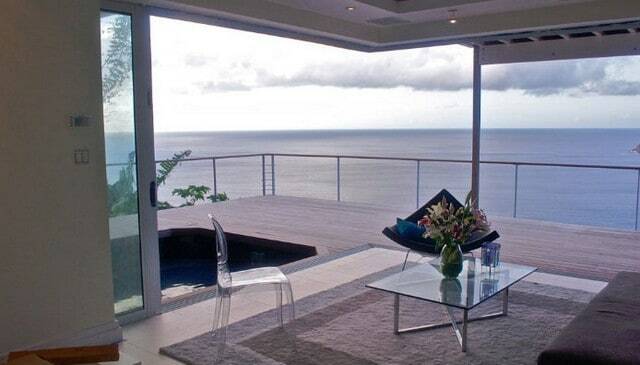 Two sections of glass balusters open up the view. 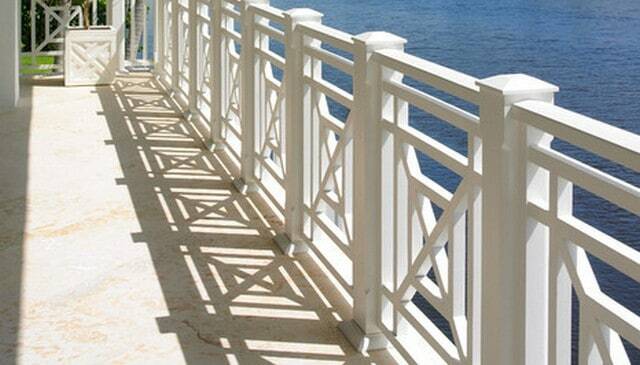 Built up wood corner posts transition to sections of metal balusters. 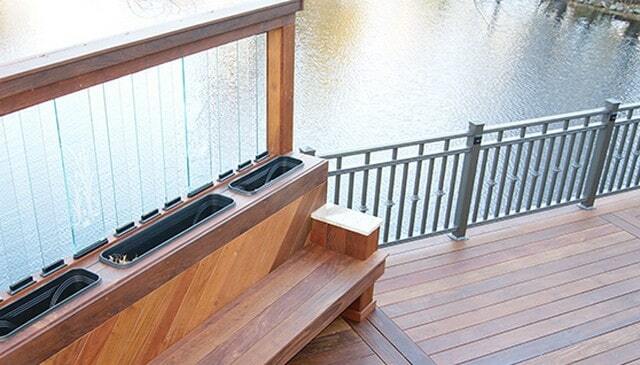 A metal balustrade terminates in an ipe wood deck railing bench with glass baluster pruivacy screen and built in cooler wells for wine, beer and liquor bottles. 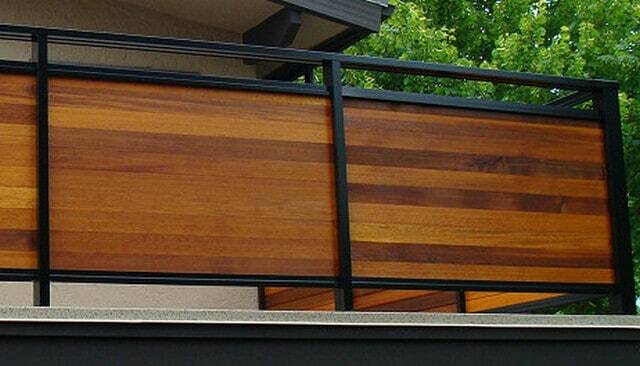 A somewhat craftsman look, this railing is framed in square black metal and has a continuous top above solid horizontal cedar 1×4 boards. 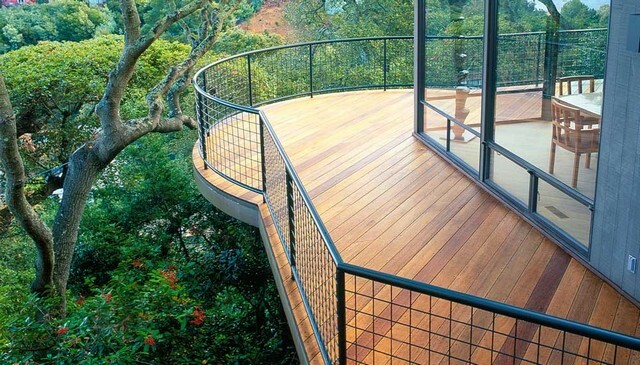 Horizontal cable railing runs from post to post above vertical 2×2 pickets in an interesting combination of metal and wood elements on this forest deck. 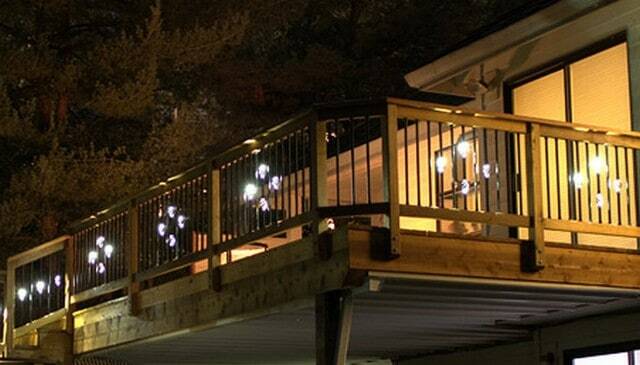 This snowy deck railing shines with the post lights reflecting off the white rails and 6″ glass balusters alternating with 2×2 pickets turned diamond style. A short knee wall railing is broken up by sections of vertical 2×2 balusters on this contemporary porch with a grill ready for summer! Craftsman style wood panels can have lots of space and still meet building code requirements which do not allow any space larger than a 4″ sphere can pass through. Sections of horizontal 1×6 boards spaced 2.5″ apart alternate with glass panels that have no top rail making for an undulating view of the mountains beyond.